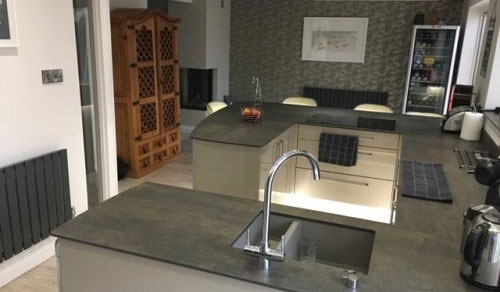 Most of our business comes from word of mouth recommendations, we are very proud of our reputation and service, take a look at our kitchen projects whether large or small, to find inspiration for your own bespoke kitchen. Our reviews can help to give you an idea of some of the fantastic work done by our passionate team of professionals. Seen something you like? Get in touch to see how we could bring it into your home. 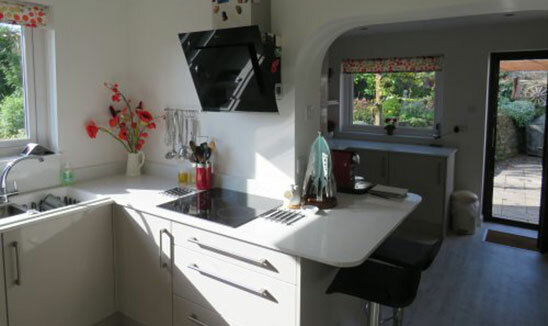 Real kitchens, real spaces for real people…. Thank god we went to KF Kitchens and not some here today and gone tomorrow firm. 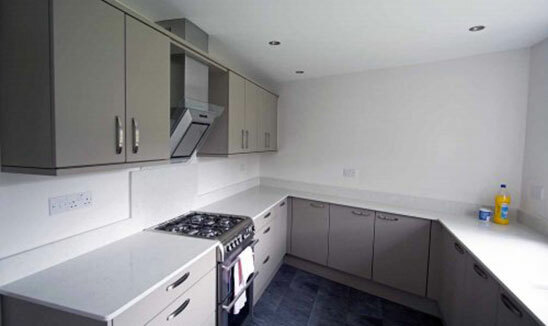 A manufacturing problem arose after 4 years KF kitchens immediately sorted the problem, no ifs or buts. A big thank you to the fantastic team at KF Kitchens. From first visit to the final installation, Nathan, Darinda and Simon could not have been more helpful. Coupled with a brilliant team of trades they have assembled, the whole design to destruction to final installation of our new kitchen and flooring has been so smooth. No need to chase anyone, the "baton" was handed over and never dropped!!!! Thank you - we smile everytime we go into our new kitchen. 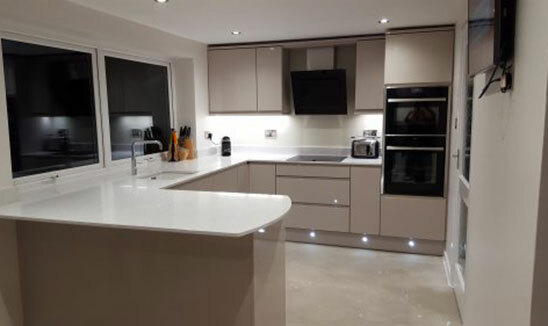 This is our second KF Kitchens installation - we were so impressed first time round that when we moved house, we didn't even think about using anyone else. Nathan's design work together with Derinda and Simon's advice at various stages were first class - as we expected after our first experience with this excellent team. Kev, Ernie, Ricky, James, Lewis, Matt, Shaun, Michael and Jason all carried out their various parts of the job with great professionalism and craftsmanship. We really can't recommend this company highly enough - they all care about their customers and the quality of the product. 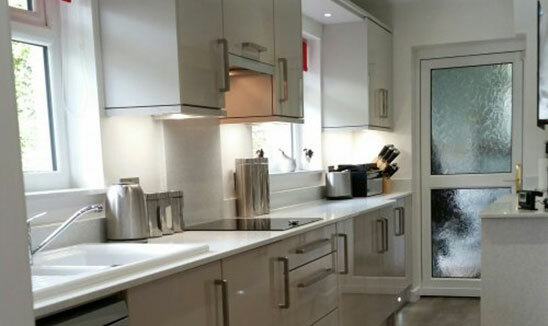 As an example, our previous kitchen had an issue after about 18 months that was the fault of the door unit manufacturer, not of KF. 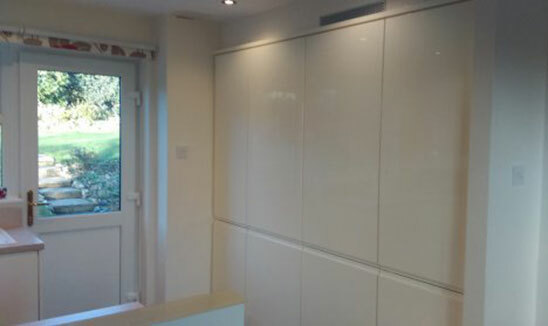 All doors were replaced and refitted without any hassle whatsoever - so the after-service is excellent too! 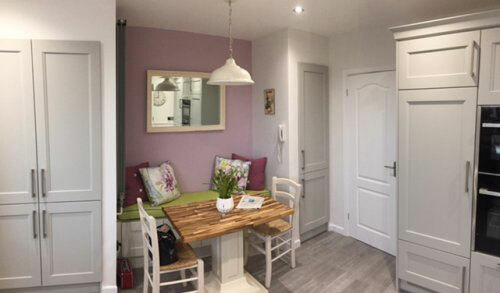 Our lovely kitchen was designed practically by Nathan in October 2014. It was then expertly installed by Gary in January 2015. In February 2018, we discovered a crack in the Blanco sink. We contacted Derinda and the issue was referred to Blanco. There was no quibble or even an inspection. They immediately agreed to supply a replacement sink. On top of that, Derinda told me that Gary would fit it at no charge. 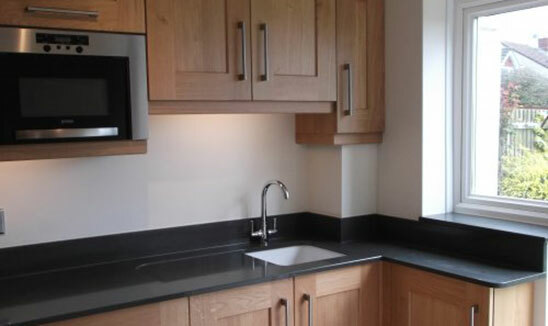 Today the sink was duly fitted by the exemplary Gary and kitchen is again perfect. A top class company run by people who care and support their customers before, during and after installation. 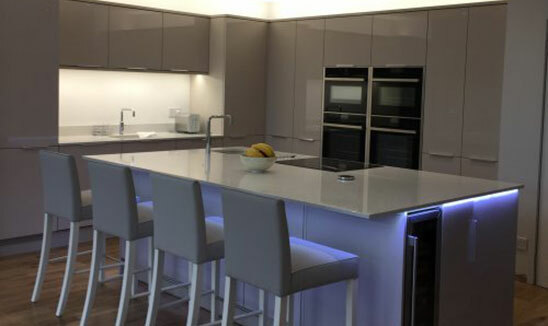 What an amazing team at KF Kitchens, with very friendly help and advice throughout the whole process. It was incredible nothing was to much trouble. Everything ran like clockwork because of good communications and excellent planning. 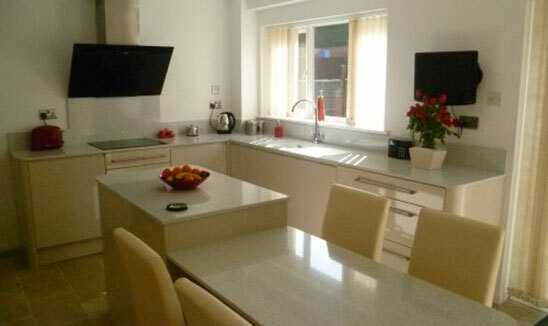 Thank you to everyone at KF Kitchens for our fabulous kitchen. A very big thankyou to Nathan, Derinda, Simon and the whole team for our lovely new kitchen. We discovered this family company purely by chance and are very glad we did. Everything was very impressive from Nathan's imaginative and practical design to the installation process. 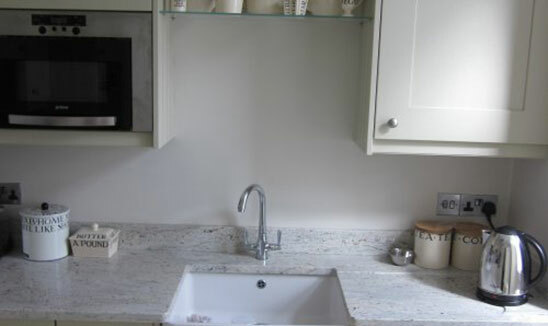 The whole fitting team were very professional and worked extremely well together in minimising the time taken. 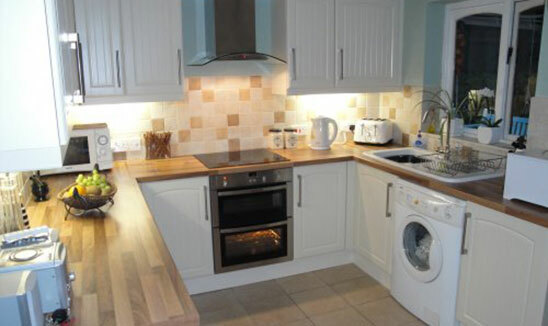 We are also very pleased with the range of appliances that Nathan recommended, and we are now learning to drive! 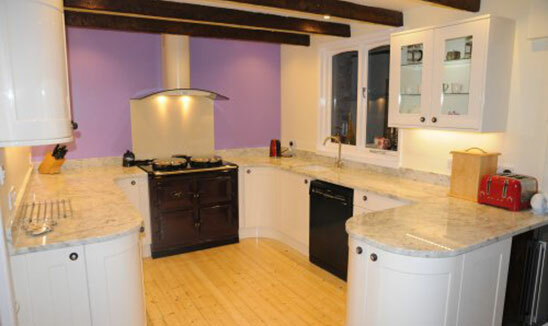 As you know our beautiful kitchen is now all finished. Firstly, we look like to say a big thank you to your both for your help and guidance when we first walked in to your store in September, like a couple of lost souls not knowing where to start. You were so good at explaining the options and giving us a good idea of the cost straight away, and it really helped us to decide. 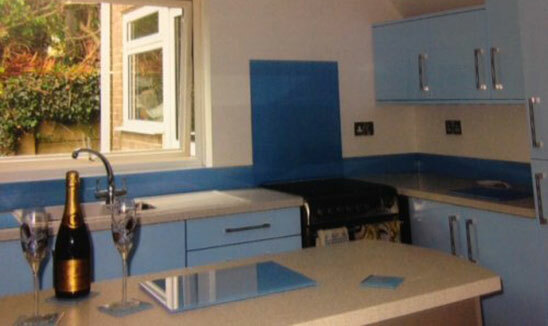 Now we have our dream kitchen, and we have attached a few photos, so you can see the finished product. 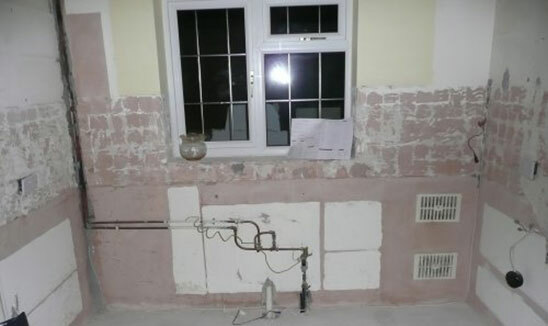 We would also just like to say how pleased we were with all the workmen who were involved. Gary of course worked so hard and was so conscientious, and Kevin, James, Matt, Ernie and Shaun and their helpers also did a great job. So thanks again, all the best. 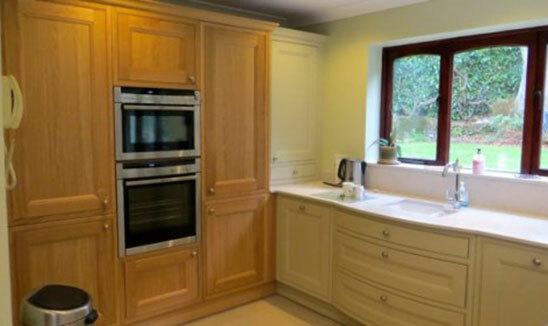 We absolutely love our new kitchen, What a transformation from our oak 1980's oak. 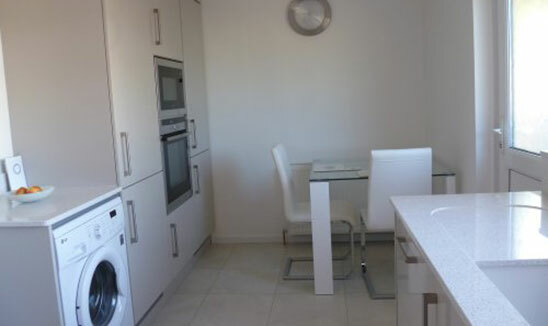 We now have a kitchen that is so light and modern. I love being able to look out onto the garden whilst cooking- as you Nathan insisted I would!!!! How I'm pleased we put our trust in you. You were however very wrong in suggesting that Andy would do the veg prep whilst I enjoyed a glass of wine- not happening! 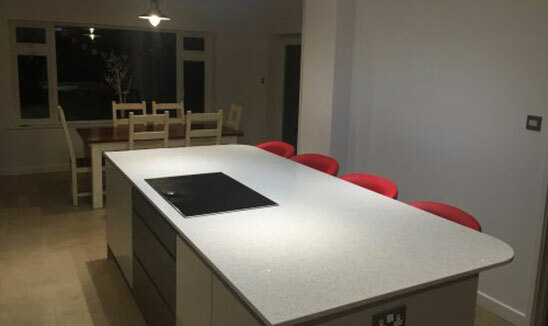 Our experience of having the KF team to design and fit our new kitchen was so professional from start to finish and we would have no hesitation at all ion recommending you to anyone. When you take the journey of improving your family home there are many agonising decisions and compromises you will make. We made the one decision that really mattered, we now have a KF Kitchen. If like us you want to get this right, here are our words based on the whole experience. We discovered a family business who are honest, trustworthy, sensible, very personal with a clear focus. 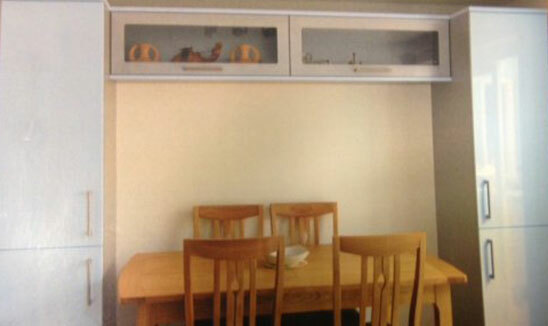 KF delivered our modern functional family kitchen without compromising design and our original brief. They did this from scratch. The KF team uphold their strap line in our opinion. 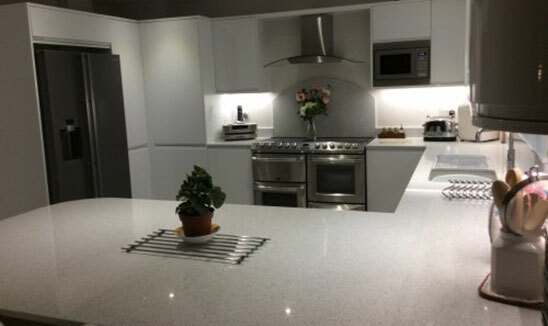 Well done KF Kitchens, all the very best for the future and thank you for our amazing kitchen. 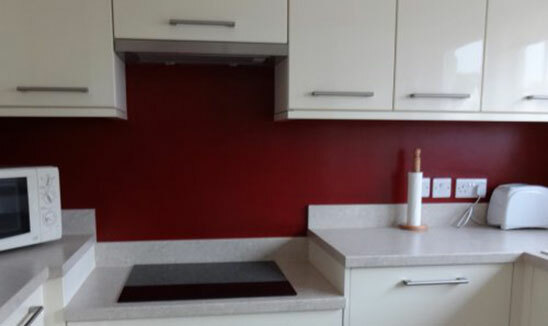 Thank you so much for giving us a new, fresh and beautiful kitchen. 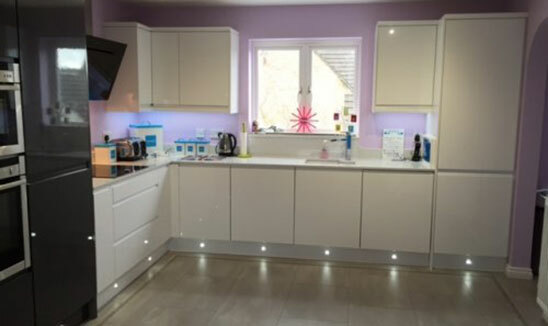 Nathans ideas were a revelation, Derinda's eye for colour was a real help and the installers were very professional, with an eye for detail in all respects. We felt our wishes were paramount at all times. So glad we chose KF. 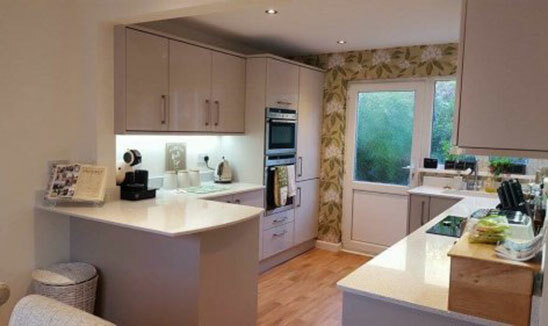 Recent kitchen fitted with painted Kew door, granite worktops and Karndean floor. Thank you so much for your expertise, friendliness, the seamless service and finally for transforming our 'dump' into the kitchen of dreams! 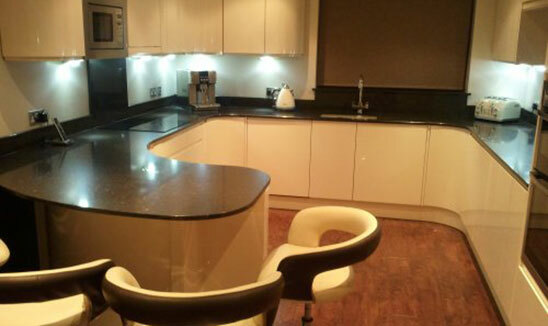 Another fantastic kitchen from Nathan and the team. The whole project went like a dream and everyone involved did their utmost to make it easy. Good humour, skill and nothing was too much trouble. 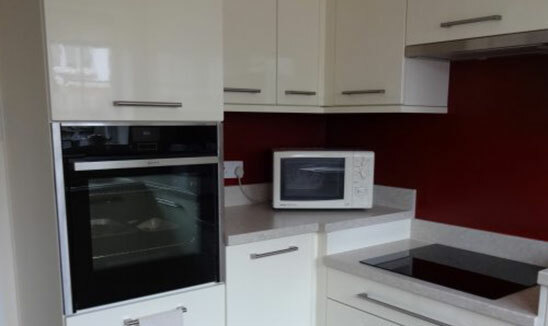 We are absolutely delighted and would thoroughly recommend to anyone who might be concerned at the disruption and aggro that goes with having a new kitchen - don't be. It was exciting to watch the transformation and actually quite good fun. Special thanks to Kevin, for 'that' tricky cupboard! Just made our first cup of tea with the hot water tap...amazing! Just in the process of moving stuff in. A huge thanks for your amazing advice and expertise!!!! 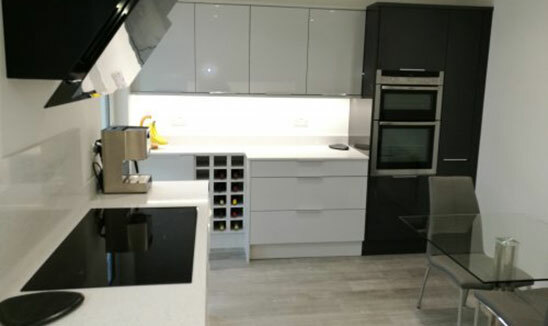 We love the better use of space, the style, quality of the kitchen and the appliances are just brilliant, you have a great team who deliver an excellent standard of workmanship. Thank you, Simon, for all your help and support and for helping us create such a wonderful kitchen. Thanks also to Derinda and Nathan. Nothing was too much trouble for any of you and you recognised my anxiety and helped quell it! 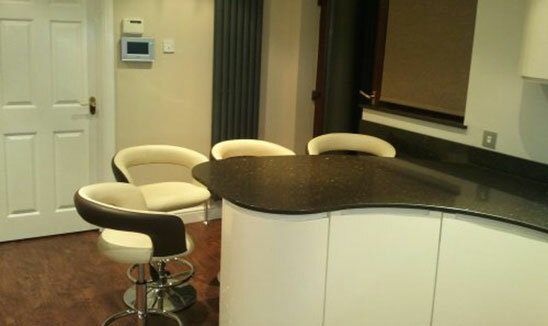 From our first visit to the showroom we were impressed by your helpfulness and professionalism. 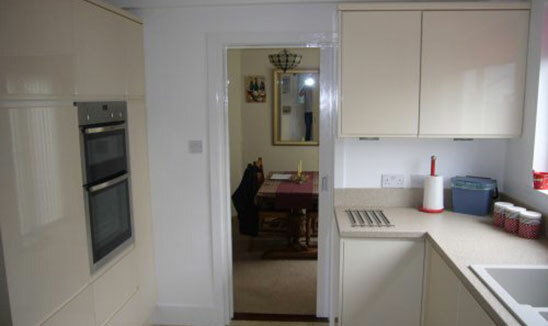 Nothing was too much trouble and all potential problems were solved by Simon before the old kitchen was removed. You sent us a fantastic team. It was a real pleasure to have Kevin in our home and to see the pride he took in his work and his attention to detail. The team turned up like clockwork. It was quite amazing! We look forward to your next visit Simon to help with photos for your use. 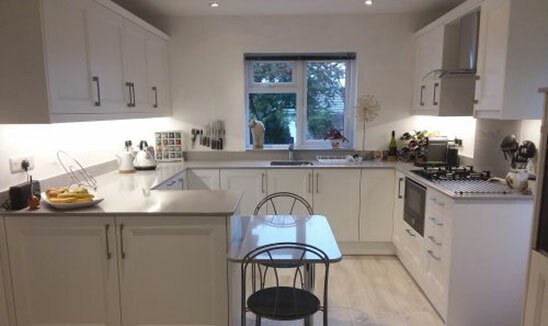 WOW - what an incredible difference you have made to our home in turning it from a traditional dull 90's kitchen & separate diner into a contemporary open plan 'party space' oh and fabulous kitchen. I came to you guys on the back of some pretty strong recommendations but have been blown away at the service we have received - you have far exceeded our expectation in terms of the full package that you have delivered - from initial concept and design where you calmed and managed our eagerness for a 100% solution on day 1 right through to final polish you and your team have been truly exceptional. Nathan, Derinda and Simon - your advice, guidance and 'calming' influence should not be underestimated. 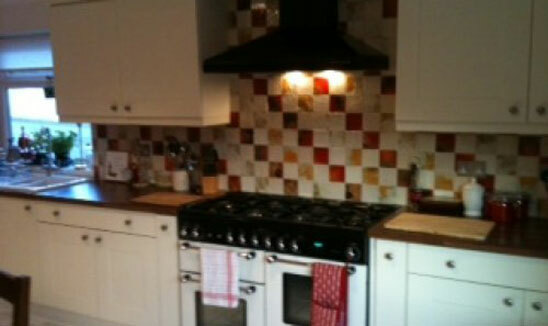 We had a good workable but tired looking kitchen and popped to see Nathan and Derinda for some ideas for an update. Well, they put us completely at ease and explained how the new kitchen would evolve, and evolve it did. 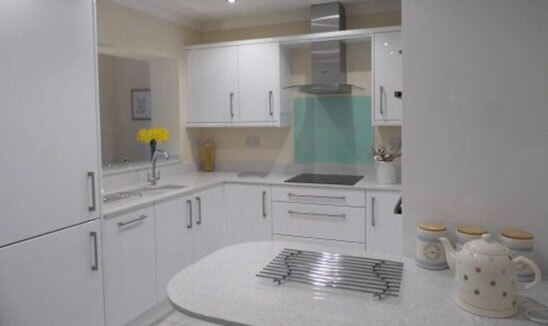 Now we have the kitchen we always dreamed of, it's a real show stopper and is beautifully finished. 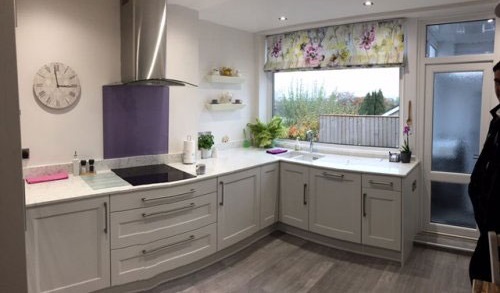 From my first thoughts about a new kitchen when I walked casually into KF Kitchens my mind was made up - that's who I'd go with! The enthusiasm and relaxed attitude of Nathan, no pushy sales talk, detailed knowledge of all the products, was so refreshing. I never regretted my decision: the whole team worked so hard and so well together that it was a pleasure to have them in the house, so much so that I was quite happy to go away for a few days during the "demolition" stage and leave them to it. It proved to be "one of those kitchens" with several problems - none of which were of their making - which they solved quickly and with humour! Derinda was very competent on the design side, producing wonderful images on the computer which she tweaked until we reached the right decision. All in all an excellent experience - now I'm looking at new wardrobes - from Nathan and Co of course! 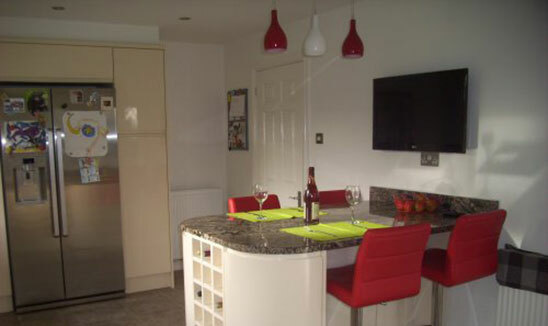 We are so delighted with our new kitchen and living space. 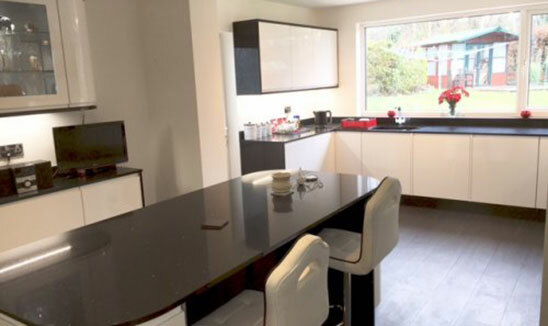 From Nathan's first visit, inspiring suggestions, careful planning, and an organised programme of work, to a completed kitchen, everything has been done efficiently and with minimal fuss. Nathan's vision for an open, airy space has completely transformed what was 3 connecting but separate, dark rooms. Being able to see a demonstration of the NEFF products, alongside Nathan and Derinda's product knowledge, helped us to make confident decisions, and I would highly recommend the demonstration cookery events. 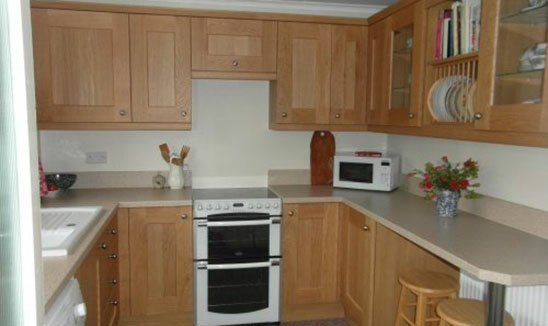 I thought I should contact you and say how pleased we are with our new kitchen, 3 months down the line. 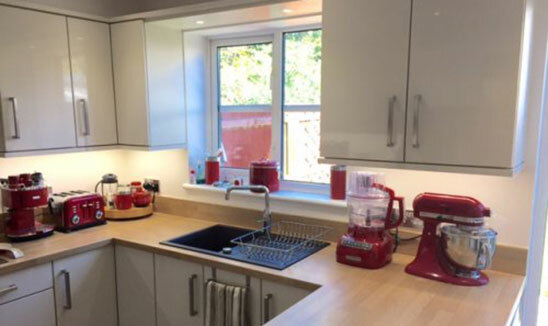 We are amazed how different it all feels; the utility section is now fully incorporated into the kitchen and makes a wonderful food prep area when the two are working in the kitchen. We use the breakfast bar for breakfast and lunch, something we did not expect. At the outset we were a little concerned (despite your reassurances!) how the various contractors would work together. I was astounded how well they planned and coordinated things together, mobile phones in this case were very useful. 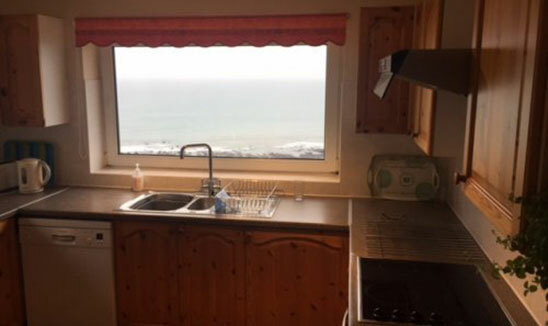 However the star of the show was inevitably Kevin, his attention to detail, suggestions for the positioning of doors and shelves, and his design for the airing cupboard were outstanding. My wife is really happy with the service, contractor competence and of course the finished product. 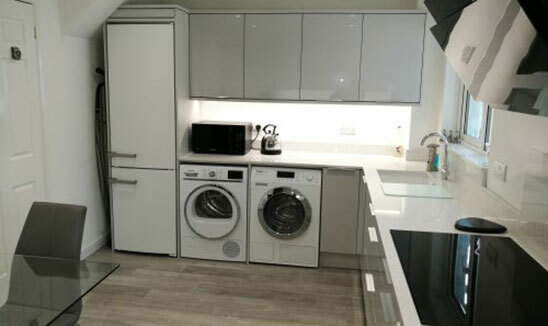 As a wheelchair user I need the units and appliances at a height suitable for my personal needs. 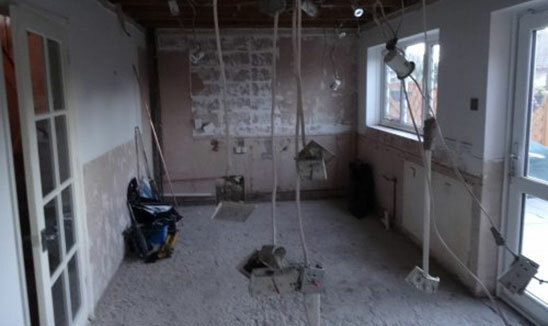 Other companies suggested 'chopping a bit off here and there' I almost gave up as there seemed no point in having a new kitchen that was not suitable. 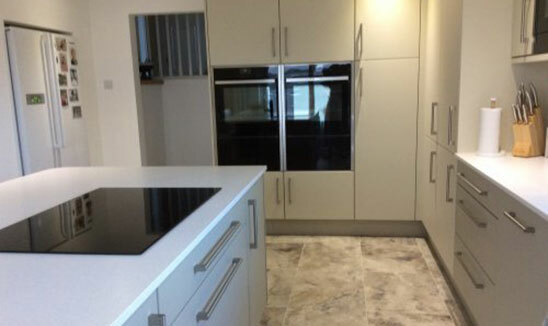 Going to KF Kitchens was like a breath of fresh air, everything could be fitted at exactly the height I wanted. 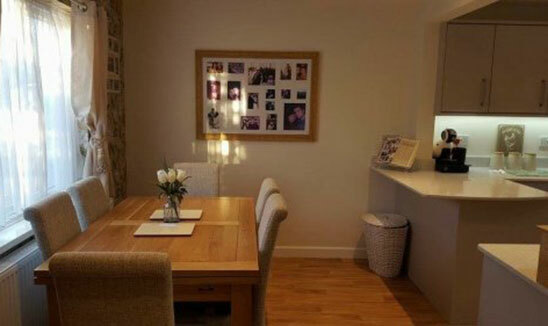 The kitchen is only small, so the layout was vital, Nathan made a number of suggestions that have worked really well. All the trades were excellent, and I am delighted with the finished result. Wow! That's been the universal reaction to our new kitchen. 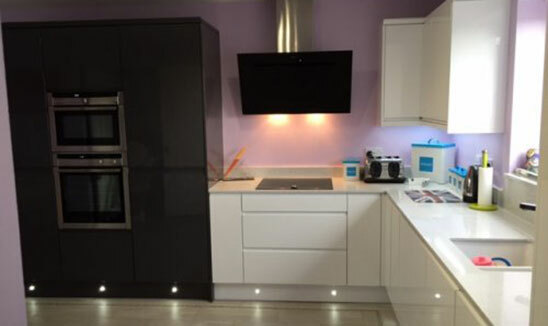 We talked to a number of kitchen companies before selecting KF. The key reason for our decision was that Nathan and Derinda were the only people who came up with good practical advice on how to layout the kitchen. The installation team was excellent. They all came on time, they all knew exactly what they were doing, and they did a great job. 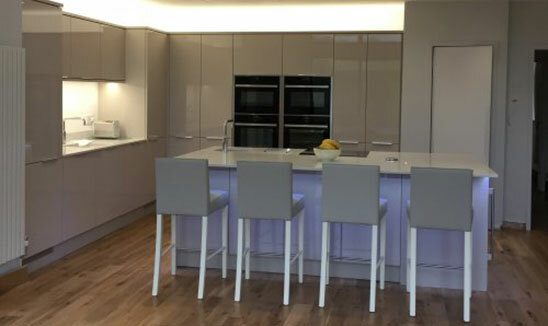 Installing a new kitchen is bound to be a stressful time, but we can honestly say that the KF team made the whole process as stress-free as possible. 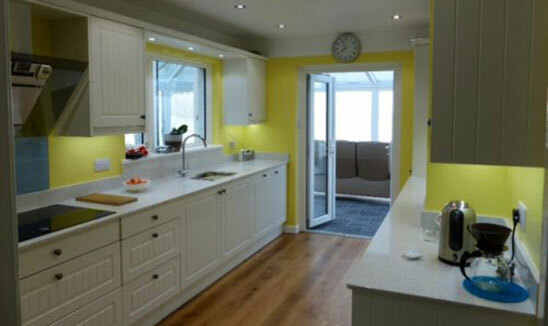 KF kitchens planned and fitted our new kitchen with total efficiency. They were very patient as we asked a lot of questions as we changed our ideas about colour and styles. All the excellent tradesmen were friendly and very helpful with good advice too. No time was wasted as everyone was continually in contact with the others to ensure a smooth timetable. The finished product is superb, and we are very happy with it. 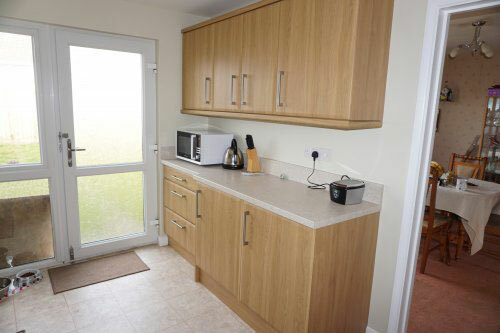 We wish to commend you, and all involved in the provision of our new kitchen. We very much appreciate your vision and your determination in the pursuit of perfection. 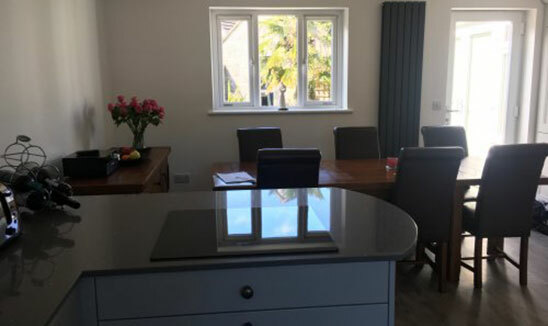 Everyone involved-Ernie, Andy, Jason, James, Matt (and their buddies) and BQ Windows were all equally driven towards providing excellent quality of work... and it shows we're over the moon with the results. 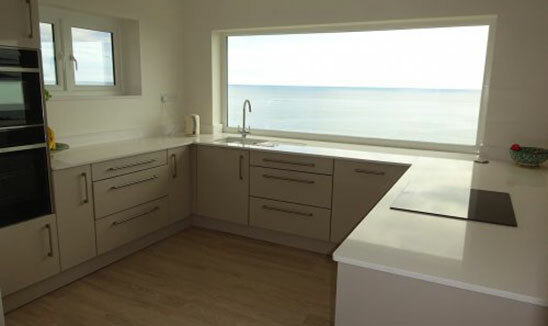 A big thank you to all at KF Kitchens, Mayflower Stone, Best Quality Windows, and all the sub-contractors who made our superb dream kitchen become a reality. 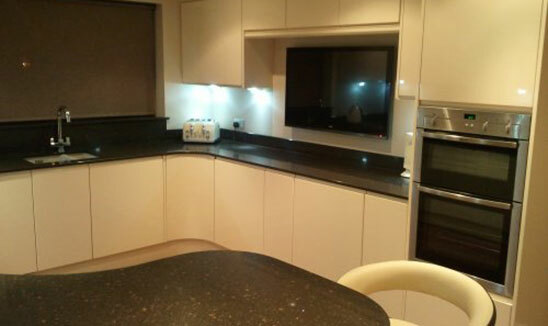 A fantastic result to what was a horrible, dark, and old-fashioned kitchen before the installation. The whole team worked expertly well together and it all fell into place as planned. Fantastic project and highly recommended. Wow! Cannot thank you all enough for such an amazing transformation of our kitchen. Usually a very indecisive type but Simon made the process very easy, his design skills and knowledge of what works and what doesn't helped tremendously. Thanks too to Nathan and Dorinda for their assistance. The whole trade team worked seamlessly, and the quality of their work is very high. We now absolutely love the kitchen and is better than we could have ever imagined. Thanks again to the whole team. 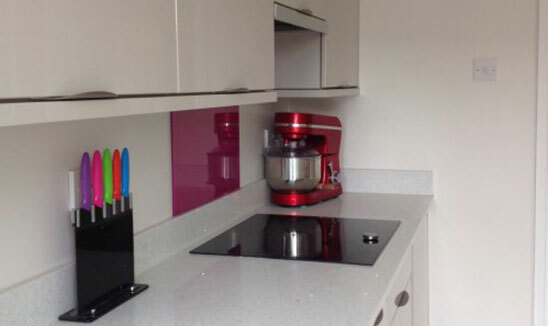 Just a note to say thank you for our new kitchen - we love it! The service was brilliant, and everything went smoothly. Please pass on our thanks to Kevin who worked incredibly hard. 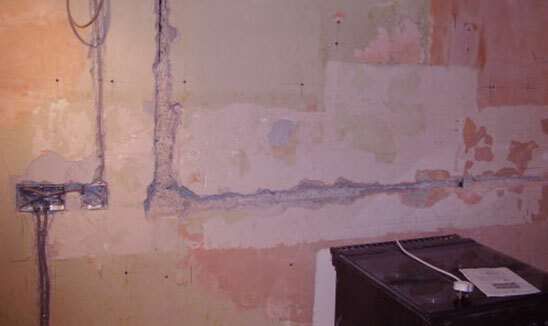 I am attaching before and after pictures, so you can see the difference it has made to our home. We would certainly recommend you and your company. Just a few words to thank you and your team for a job well done. The job progressed smoothly with each trade taking over from each other without hassle. 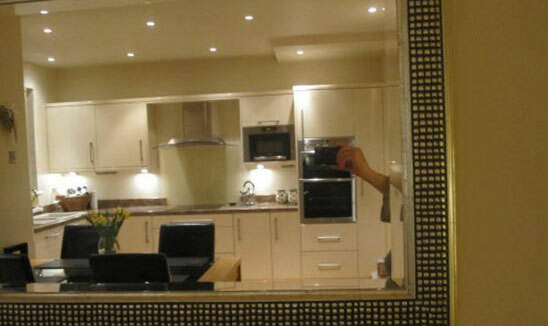 Gary the kitchen fitter to Mike the decorator, all were very professional and willing to please. Thank you. Maddy and John. 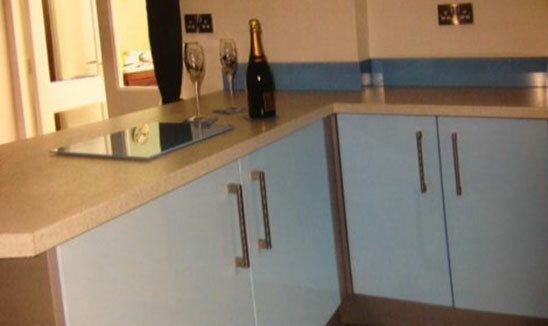 Thank you so much for our fantastic new kitchen! 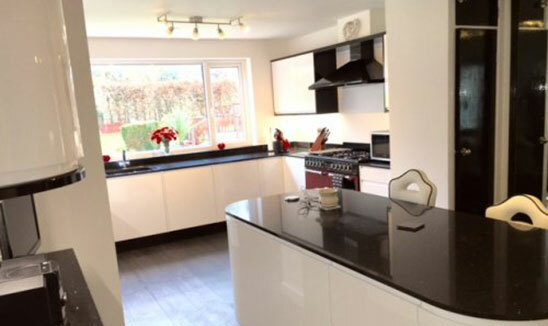 Right from the moment we walked into KF all the way through to completion of fitting the kitchen, the service has been fantastic. 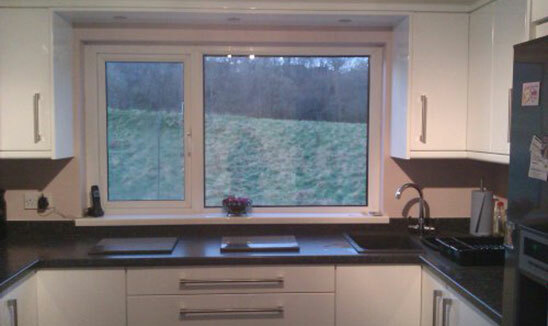 We are very pleased with the kitchen and the way it was fitted. No problem was too trivial for you and the team - the attention to detail was amazing! Thank you for updating our kitchen! The whole process was so smooth and stress-free (which helped me in my heavily pregnant state!) Would definitely recommend to others. A very professional and expert job our new kitchen is amazing, all the different trades work together to cause as little as possible disruption to the customer they turned up on time and when they said they would. Thank you, Simon, Nathan, and Derinda for all your planning and advise on our kitchen a wonderful job has been done by you and all your staff. THANK YOU FOR BRINGING US INTO THE 21ST CENTURY! We BOTH love the curves! 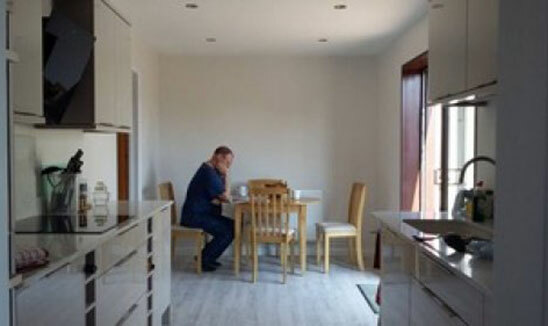 Just wanted to feedback how thrilled I am with my new kitchen. The service received by everyone from KF and the supporting team from design through to fit has been top notch and I couldn't have wished for better help and support throughout. 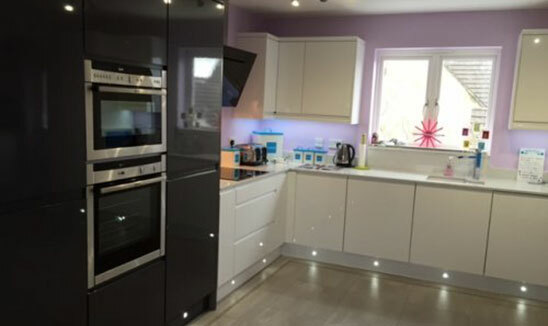 When there was a hiccup along the way with an incorrect appliance fitted it was dealt with quickly and with zero fuss, the true mark of a company focused on customer satisfaction. 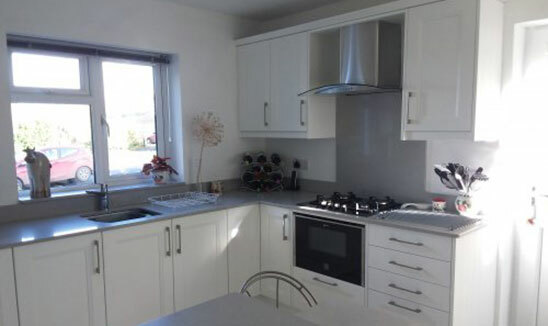 The kitchen looks absolutely amazing. I’m really pleased with the fit - Kevin did an astounding job and never 'settled', he always made everything perfect! 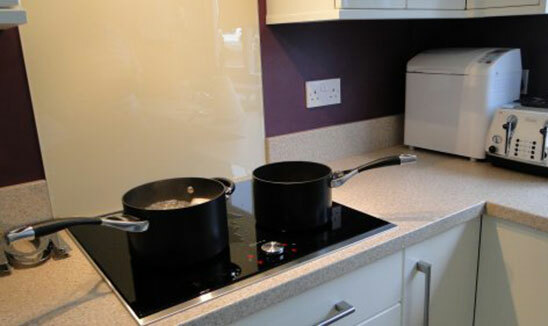 I'm especially pleased I opted for the induction hob and Quooker boiling water tap - they've both surprised me with their ease of use and I would never switch back to using gas or a kettle now. Many thanks to you all. Highly recommended! Just wanted to say how very pleased we are with the kitchen and to acknowledge the great service we received throughout the process. 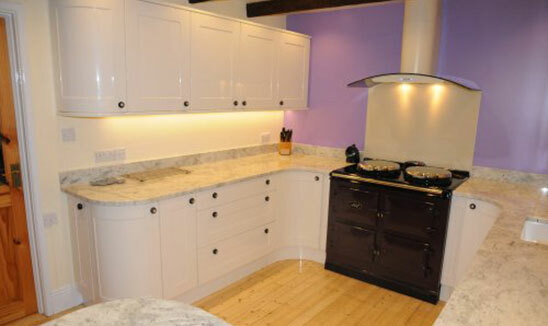 The design solution was tailored to our needs and Simon was instrumental in designing our kitchen just right. The overall price was comparable with other quotes from kitchen store chains, but I am so glad we went with KF. 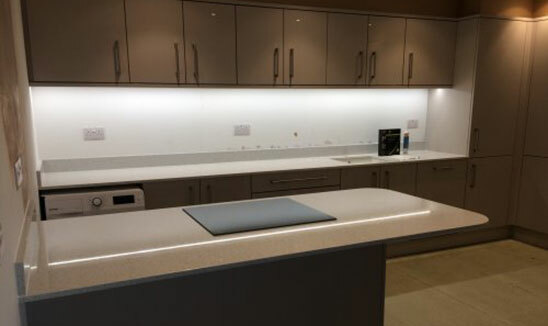 The installation was smooth and Kev the fitter was absolutely faultless and the consummate professional who took pride in his work and applied the finishing touches that a big store would not have done. James the electrician and Mayflower Stone were just as professional. 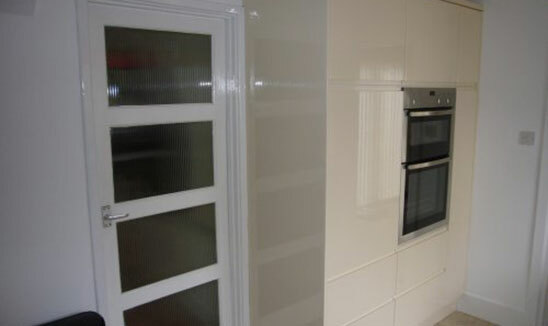 All our friends have commented on the very high-quality finish and effect which is all down to your team. I would have no hesitation in recommending KF again. Great job - thank you. A very professional and expert service all round. 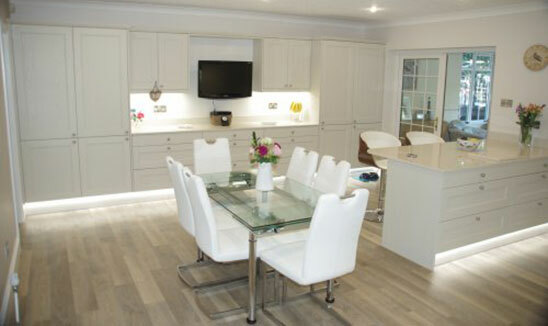 The whole team involving different trades worked so well together on what was a huge re-design project involving knocking down ceilings and several internal walls with all the extra steel work that involved and removing doors and windows to create a superb large open plan kitchen/family dining room. 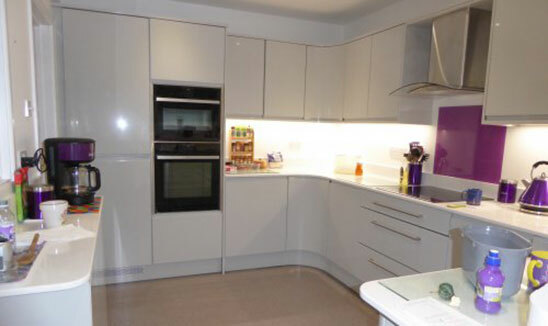 The quality of the units is excellent, and the design and layout are just what we wanted. 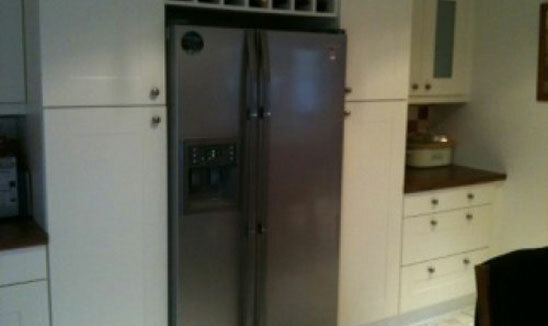 The Artline larder units are fabulous and the Neff appliances look so smart. The service offered by Mayflower Stone and Best Quality Windows, both recommended by Nathan was equally impressive. 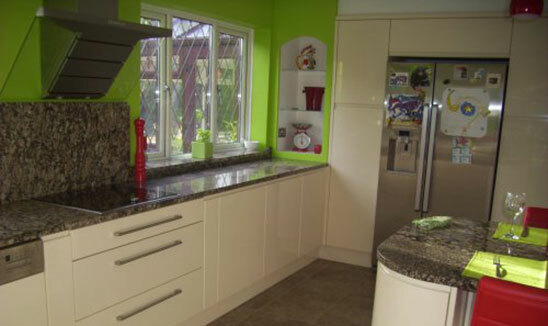 We would recommend KF Kitchens to anyone wanting a whole package managed by one company. Brilliant. 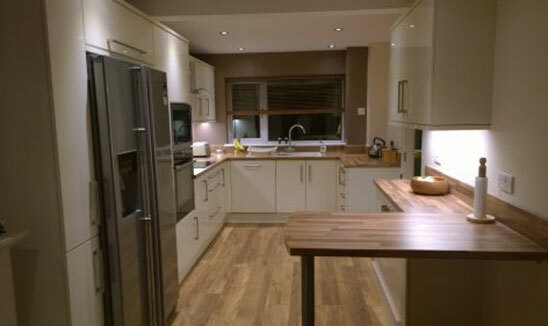 We had our fantastic kitchen fitted in July. We cannot recommend KF and the team highly enough. It took four weeks as we were knocking two rooms into one. However, the whole team kept each other well informed as to their progress so we did not need to chase anyone up for the next step. 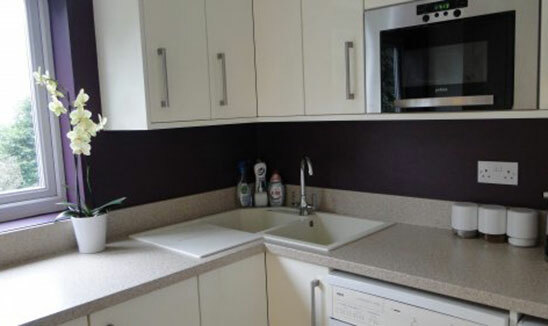 Ernie the builder, Matt and Dan the plumbers, Jamie the Electrician, Jason the floor tiler, Shaun the Painter, Mayflower Stone for the worktops and Gary the excellent kitchen fitter. Also a big thank you to Simon for all his advice and planning and patience, and Nathan and Derinda who were always also on hand for any backup advice. We are thrilled with the finished result - our friends and family say it is like a show room. Thanks to you all. 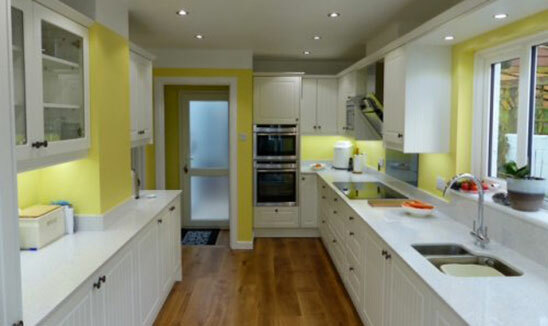 Thank you to everyone at K F Kitchens for changing our ordinary kitchen into a "wow" kitchen. Special thanks to Nathan for his advice and planning, and Kevin for his work in the fitting. Thanks to Derinda, Simon for their advice and to James, Ernie, Mike and Jason for their excellent work. 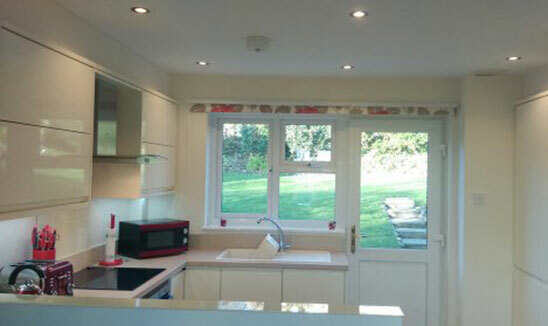 The kitchen is now finished and looks fantastic. So far everyone who has seen it has been really stunned by it. Thanks very much for all you have done as it wouldn't have been like this without all your advice and guidance. Incidentally doubling the size of the kitchen window was worth it! The whole process has been so smooth and seamless, and it was a pleasure having every single one of the team in the house. They were all very easy to have around. And as for the finished result........We are absolutely thrilled! It all just slots together perfectly. Thank you for all your expertise and guidance, all your hard work coordinating everything and for gathering such a fantastic team! 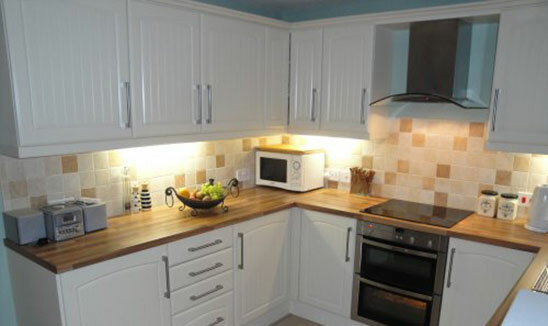 Just want to say how pleased we are with our new kitchen. 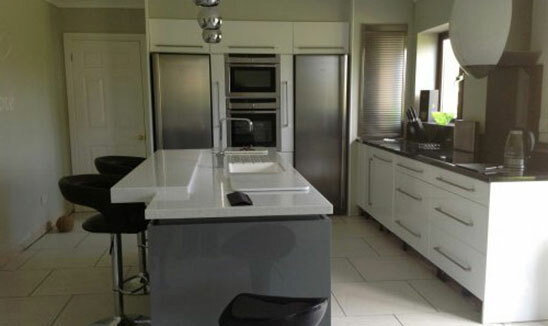 From initial design throughout removal/fitting of kitchen the standard of workmanship has been second to none. Nathan, Dee and Simon could not have been more helpful and experienced in the products we purchased. 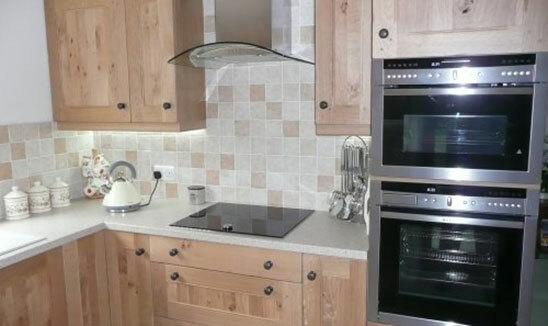 A special thank you to the kitchen fitter Kevin who went that extra mile to complete the project. 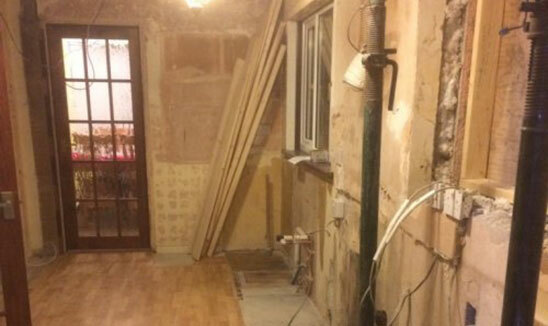 Removal of old kitchen/debris was completed swiftly and efficiently. We would definitely recommend and use again. Thank you for resolving the problem with our sink drain so quickly and easily. Much appreciated. 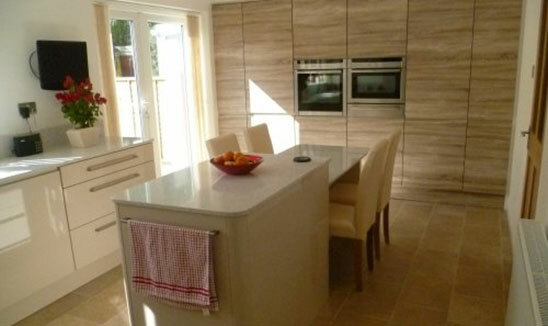 Kev said that you may be able to quote for fitting a new kitchen when we eventually move to Cheltenham? 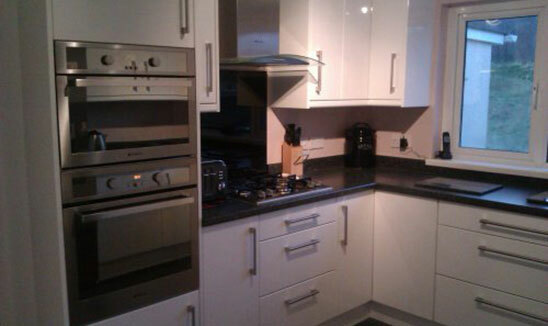 Just thought you might like a few pictures of the kitchen now the final coat of paint has gone on. 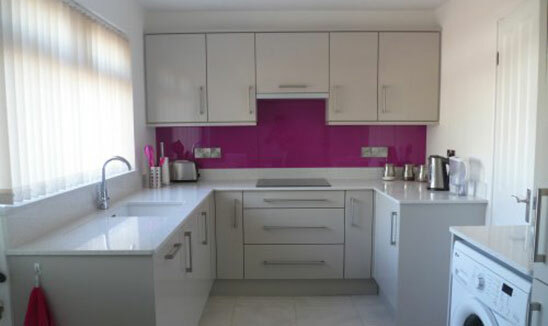 We are so delighted with our new kitchen. Thank you, Nathan, Derinda, Simon and team for a smooth installation and a great final finish of everything. We love it! 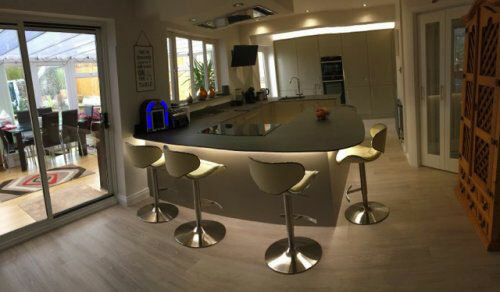 From the design stage to fitting everything was completed superbly and the after sales service has been up to the same five-star standard. 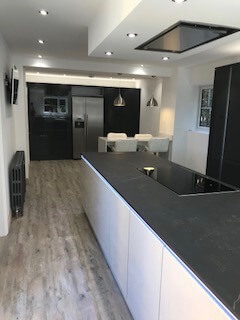 Kevin who fitted the kitchen and Simon who designed it were and continue to be superb 15 months later as nothing is too much trouble for them. I would recommend KF to all. 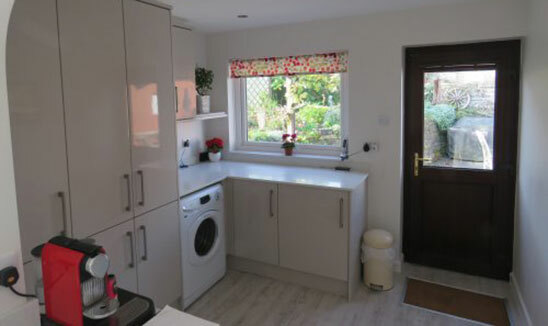 Now that the kitchen is complete, except for blinds which come @ the end of the month, we felt that we would like to write & say how pleased we are. The whole package has been brilliant. 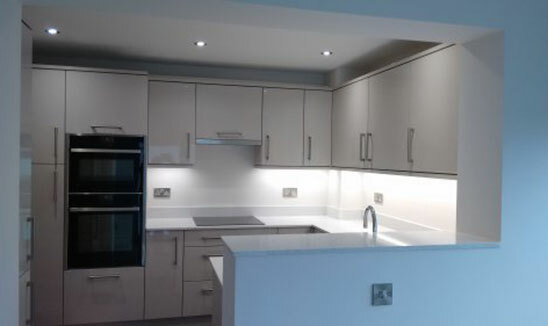 We are delighted with the finished units/ worktops, ceiling & lights. 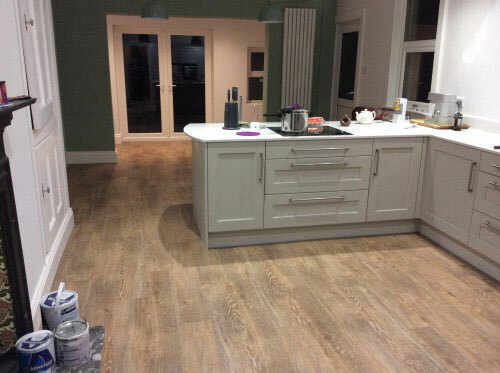 The new Karndean flooring, which we have had before, looks very good. All the workmen did a good job & worked well with each other, including Mr Glanville the waste remover. 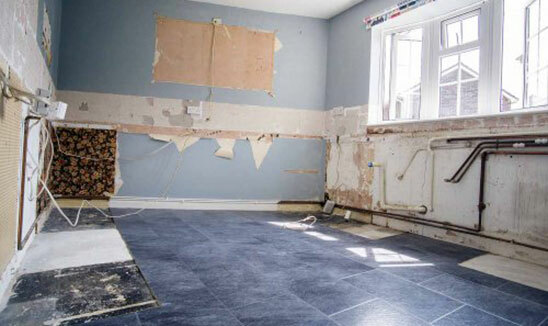 Special praise must go to Kevin Drewery, the fitter & Jason Edmondson, flooring fitter, who really did a superb job & seemed to go that extra mile to ensure satisfaction. I am enclosing a few photos of the finished project. Thank you to you both for your project management, planning & wise counsel. 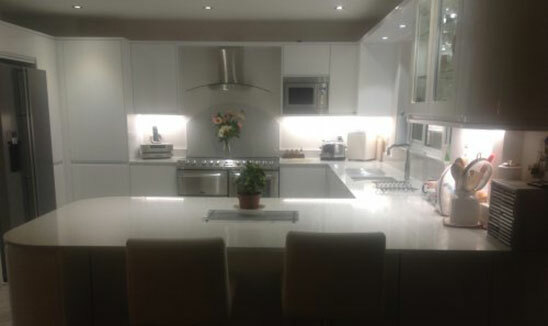 Hi Nathan, now the kitchen is completed we would like to thank you and your team for doing a wonderful job. From the outset the approach has been thoroughly professional. Being given clear and precise costings from the start gave us confidence that the project would be completed on budget. 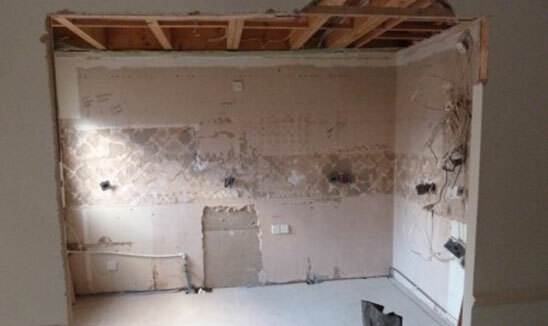 As well as yourself, we would like to thank Ernie for the destruction phase, particularly his expertise in taking down a wall and leaving the dining room coving intact. Matt and Dan the plumbers could not have been more helpful. James the electrician gave great advice and completed his work perfectly. 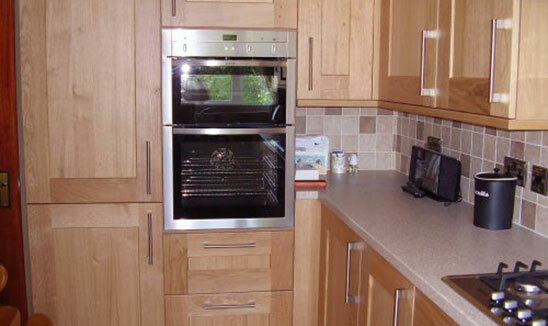 Thanks should also go to Kevin who fitted the kitchen with skill, care and real attention to detail. 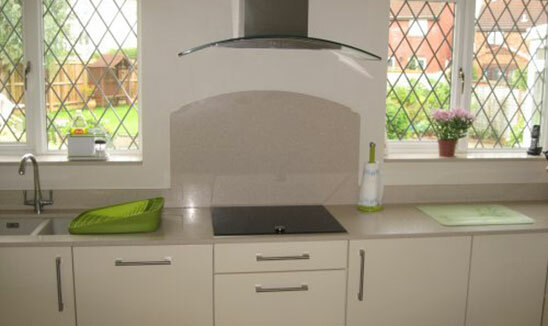 Mayflower stone did add the 'wow' factor and Sean's decorating beautifully finished off the whole project. 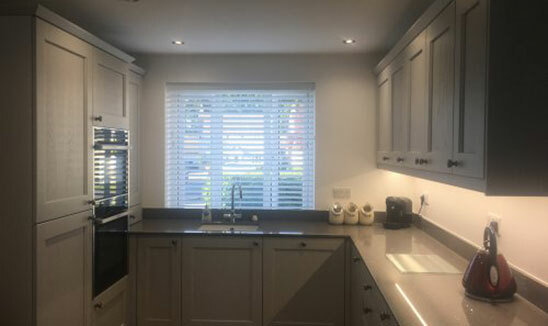 We are absolutely delighted with the finished article and we have no hesitation in recommending KF Kitchens to anyone thinking of having a new kitchen. 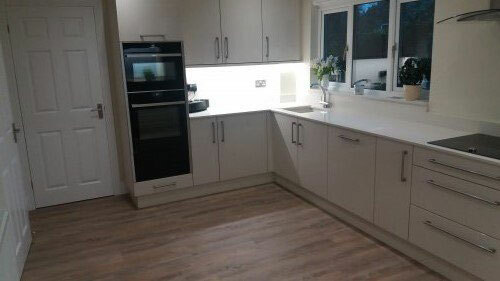 With all the Christmas rush this is the first chance that we have had to thank you and your team for installing and completing our kitchen in such a timely and professional manner. Over the years, we have experienced many changes to our home that have involved various electricians, plumbers and general workman. This recent experience has been one of the smoothest and most worry free! We compliment you on the calibre of the workmanship; commitment to communicating daily with us in a warm, friendly, positive manner; excellent advice and design input and overall experience. These qualities are highly valued by us as the home owners. There can be a lot of anxiety involved in inviting 'strangers with tools' into your environment every day and placing the fulfilment of a one's vision into the hands of others. During the 3 weeks, we did not feel that apprehension, so we say, 'kudos to you all. We would be pleased to recommend your work to others. Thank you so much for the work you and Derinda put in to making it all come together, we are very pleased. 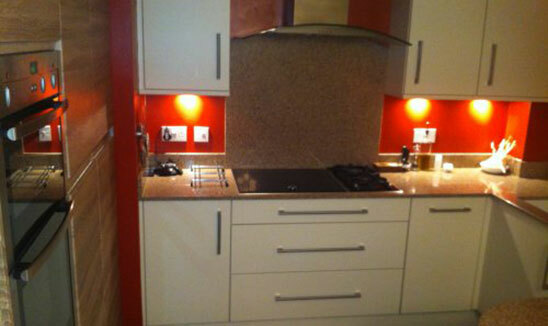 Photos of kitchen recently installed.. 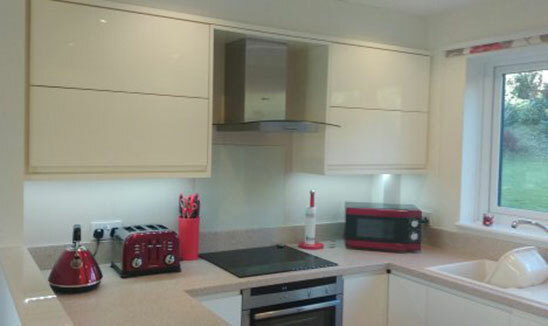 I have finally got around to getting the splash backs, so I thought I would send you some photos. 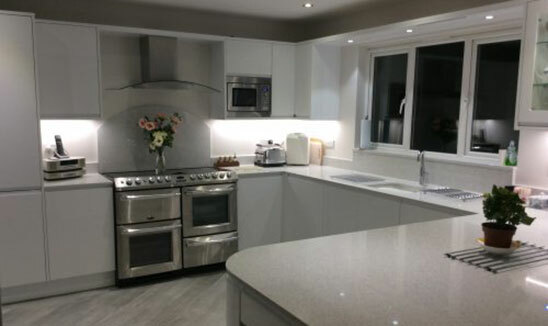 Bob and I are thrilled with our new kitchen and Neff appliances and would like to thank you for all your patience and advice in both design and selection of units and appliances. The installation went like a dream and Gary our fitter was meticulous. 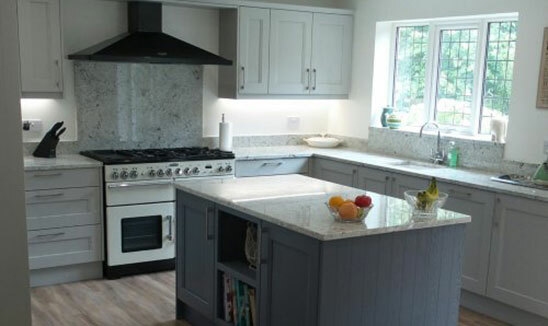 If we ever move to a new house you will be our first port of call because I wouldn't settle for anything less than one of your kitchens and Neff ovens! I also enjoyed the demonstration in September and it was lovely to be invited back to one, I still learned lots. 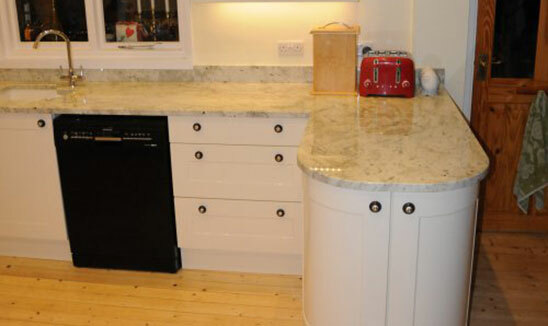 A really good, professional and personal service, with top quality fitters. 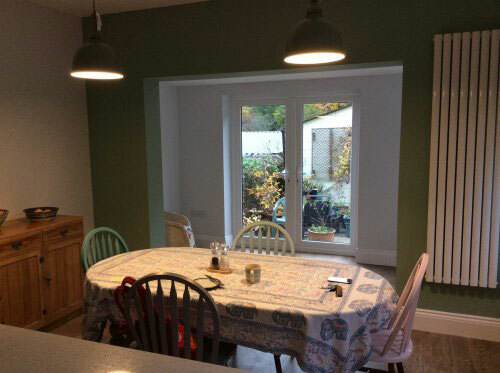 We are delighted with new kitchen/dining room. 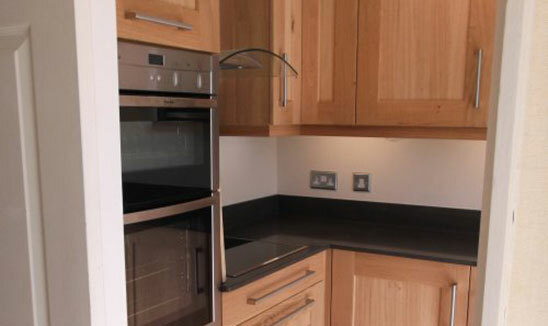 Very impressed with quality of units, appliances, tiles and the team who worked seamlessly on the project. 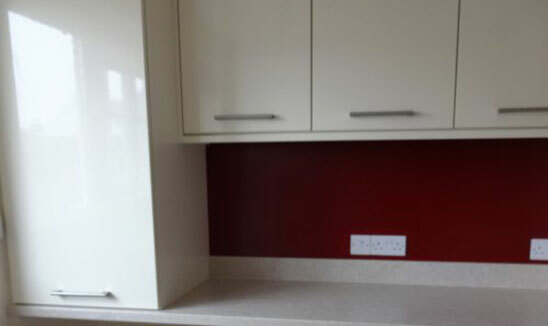 The entire process was professionally handled, from planning, gutting out, installation, work surfaces, tiling the floor and finally painting. The experience of the work people and quality of their work cannot be faulted. 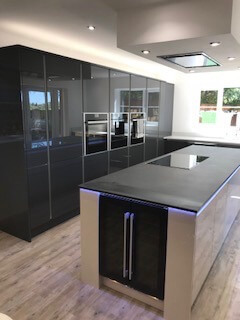 Truly professional service where nothing is too much trouble, would definitely recommend " KF Kitchens "to anybody looking for great kitchen designs real value and exceptional quality plus a friendly team that always give that little bit extra. Dear Simon, Nathan, Derinda and The Team. 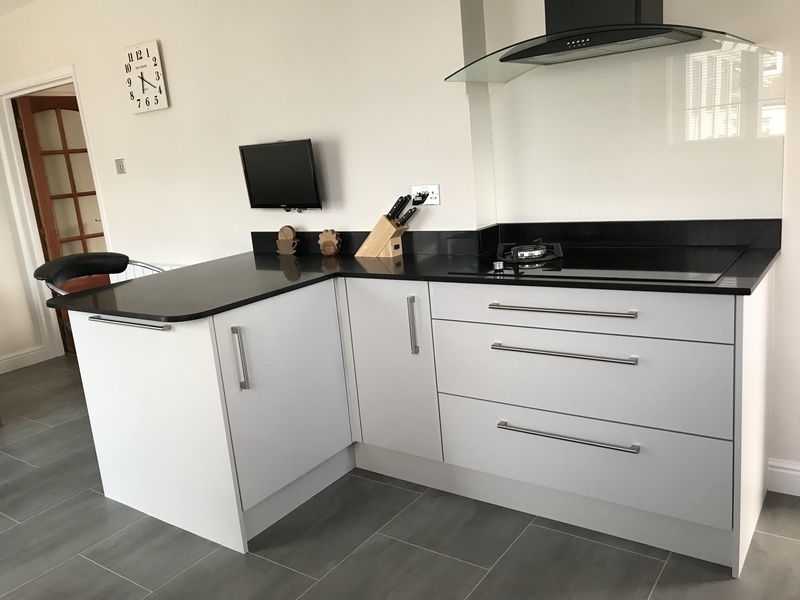 Thank you ever so much for our wonderful kitchen, we wanted an easy clean and clutter free kitchen with lots of storage and your excellent designing and attention to detail was outstanding. 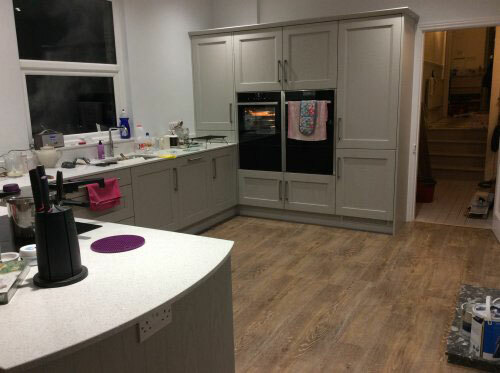 We particularly like to thank Kev for his efforts in fitting the kitchen, Jason for laying the lovely Karndean floor, Matt for making our house warmer and installing the kick heater in the kitchen and Mike for decorating. I actually enjoy washing up now!! Thank you again for your best efforts and making our dream kitchen come true. 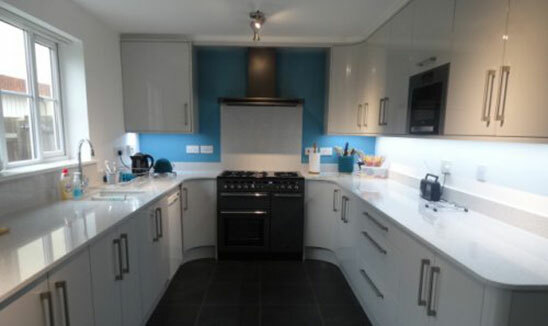 Our new kitchen is everything we could have wished for ... and more! We are so very pleased with it! 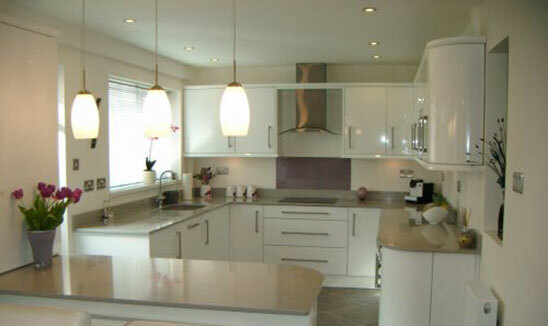 To anyone thinking of fulfilling their dream with KF Kitchens, we would say 'Go ahead with complete confidence!' The showroom is superb, and Nathan, Derinda and Simon are so very genuinely friendly and very knowledgeable, it is easy to feel instantly comfortable. From our very first visit to the showroom, and that subsequent meeting with Nathan, we were inspired! 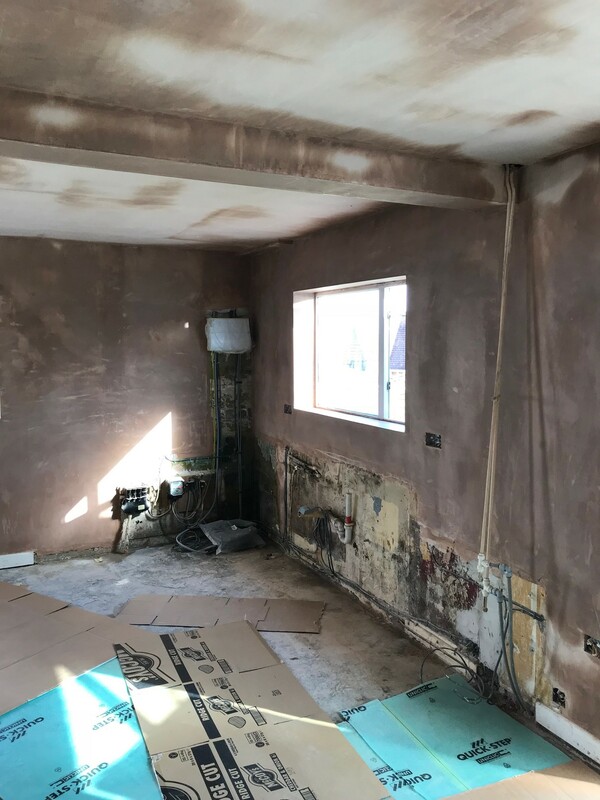 Nathan's enthusiasm for his job, and his professional expertise were clear, and with his help we were supported at every step of the process of considering every aspect of our new kitchen. Thank you, Nathan! One aspect we very much appreciated was being given time! Nathan's time, in order to answer any questions, to provide any information requested and to ensure we understood everything we discussed. Nothing was too much trouble! Time, too, to think about everything we were considering and to come to decisions in our own time. Thinking time is crucial when making such important decisions! At no time did we feel at all pressurised. 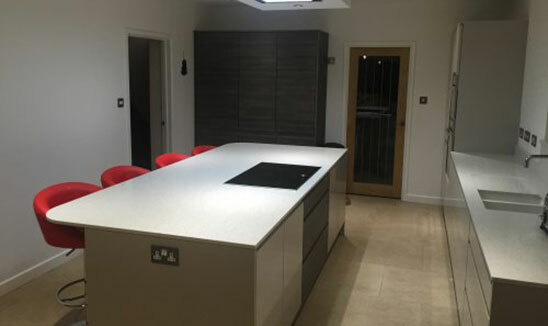 The work was carried out by excellent, highly skilled tradesmen who had clearly been very carefully selected for their strong work ethic and unfailing attention to detail. It was a real pleasure to have the various tradesmen in our home. They were unfailingly polite and respectful. 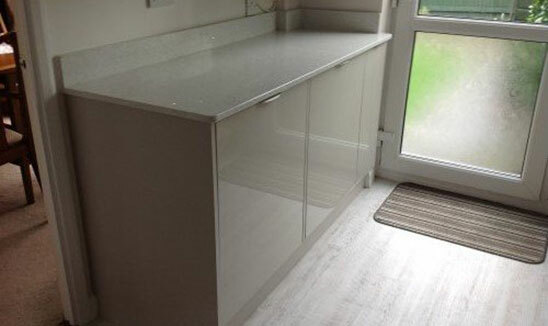 Thank you, publicly, to: Gary, for the exceptionally high standard of your work in fitting the units and appliances; Ernie and his assistant for your superb quality of plastering; James, the electrician for your very clear professional understanding and expertise; Jason, for tiling our floor so meticulously with Karndean tiles, and Michael who carried out the final decorating. 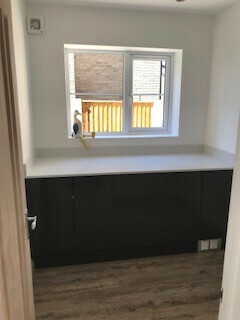 Thank you too, to Matt, the plumber who works as part of the KF Kitchen team, and Dan, who carried out an excellent cloakroom renovation for us at the same time. The work was excellently project managed, and each stage flowed very smoothly. We were always kept fully informed, and there was no stress for us at all. Undertaking a project of this size required us to put our trust in someone! 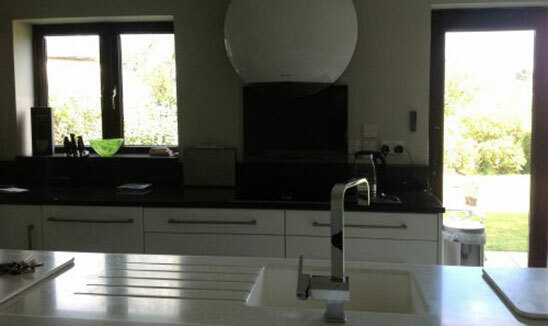 Our trust in KF Kitchens was totally fulfilled! We are so very pleased we trusted Nathan and his team! Thank you to everyone for a highly professional kitchen experience we would never have dreamed could be possible! We wish KF Kitchens well deserved, continued success! Thank you! 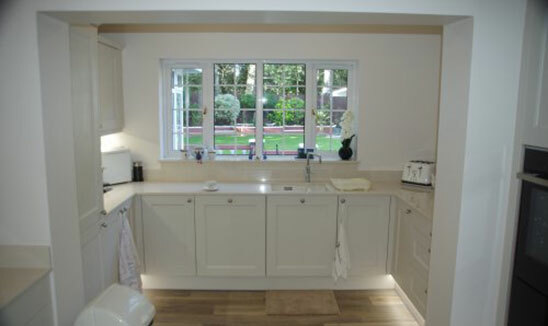 A note to thank KF Kitchens for a fantastic kitchen and utility room. 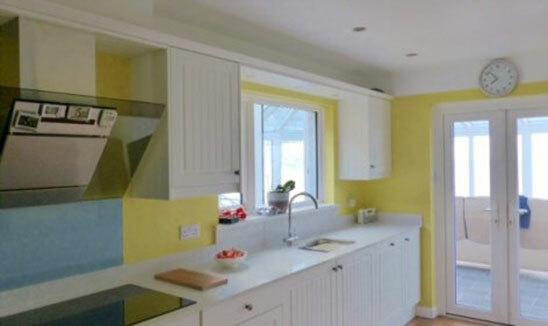 primarily our thanks go to Nathan and Derinda, with some help from Simon, for guiding us through what might have been a maze of decisions regarding cabinets, worktops, wall tiles and floor tiles and the resulting colours. we also thank the team of workers headed by Kev followed by Ernie, James, Keith, Mike and Jason, all of which were second to none, not forgetting the other Kev who removed all the debris. 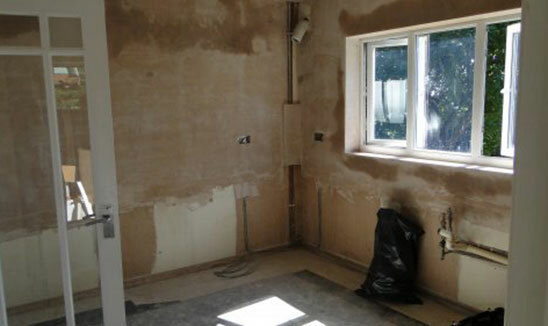 Nothing appeared to be too much trouble for them and the resulting quality of the work was second to none. I have never before found reason to write to convey our sincere thanks to a fine team of perfectionists. Initial approach extremely helpful and advisable. Variety of workmen employed, each of which provided first class workmanship giving no cause for complaint. 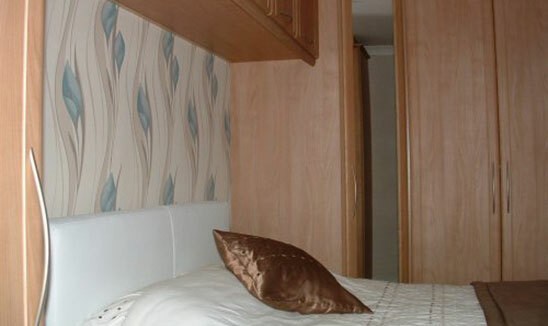 Owners provided first class knowledge and opinions as to various items and colours schemes at all times. I have never before experienced work done to this degree of perfection. Thanks so much Simon for your patience with us tweaking your design, hope you agree that it looks brilliant. 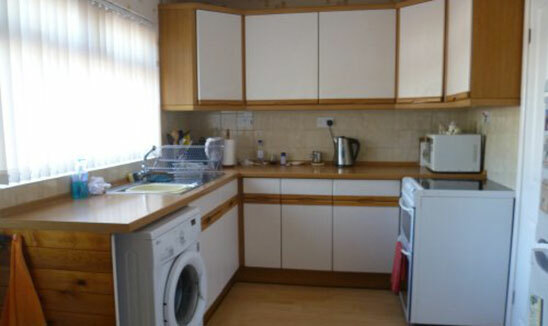 I would like to thank you very much for giving me a kitchen that I never thought I could own. Peter & Paul the fitters, James the electrician and Keith the tiler all did first class jobs. I obviously got the 'A Team'. Excellent service all round including Nathan and his wife in the showrooms. Thank you all once again. 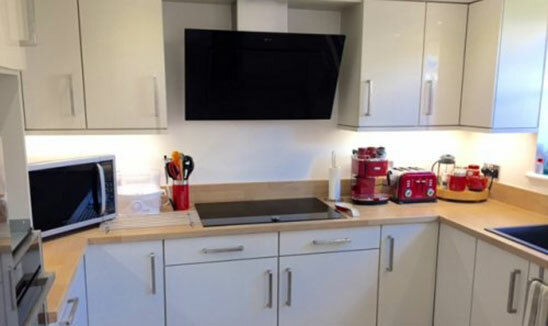 We are delighted with our new kitchen which looks stunning as well as being practical and a joy to use. The replacement was completed nearly 6 months ago so this is the ideal time to comment on all aspects of the process, from initial design and planning through to after sales service. 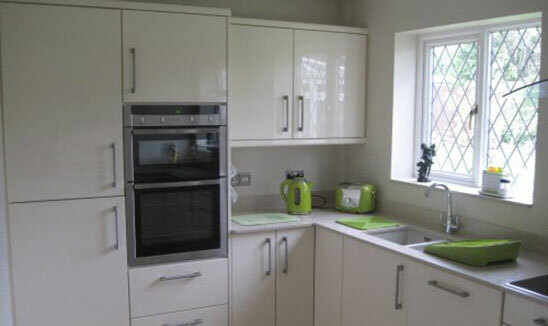 Early this year we approached local and national companies to completely re-new our outdated and tired kitchen. 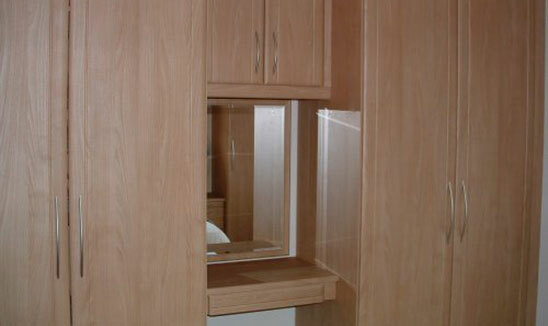 From the outset KF Kitchens stood out head and shoulders above their competitors. First contact was in their showroom where Nathan and Derinda were friendly and approachable. Within a few minutes of walking into our “old” kitchen Nathan had visualised how best to use the available space. The design stage was a 2-way process with Nathan sympathetic to our own ideas. None of his competitors were as innovative with their proposals. True to his word, within 3 days Nathan had produced an initial design and a realistic estimate of cost. No one else provided the same efficient service. The KF showroom is well designed and optimises many features, including well-coordinated accessories. 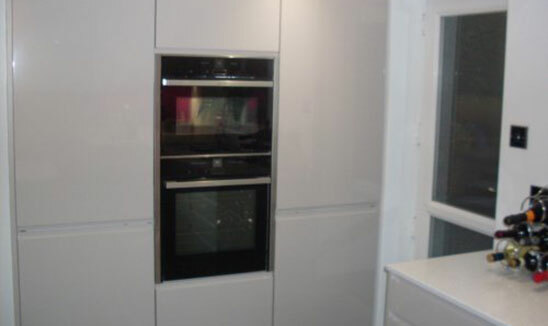 The comprehensive range of working Neff appliances was an added bonus. 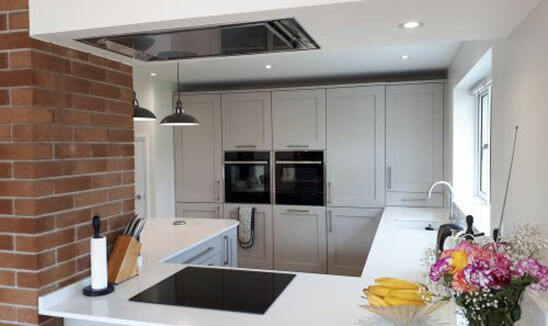 We appreciated Nathan and Derinda’s in depth knowledge of the Neff range of quality products, and their advice in choosing the best items to suit our needs. A modest deposit confirmed the deal and subsequent payment terms were much more realistic than other companies. 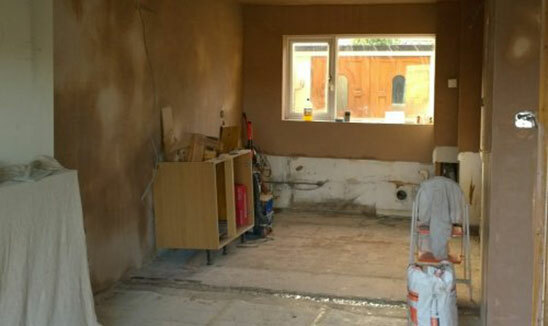 All of Nathan’s specialist tradesmen were carefully chosen and they all did a thoroughly professional job, with particular thanks to Gary for his outstanding carpentry skills. 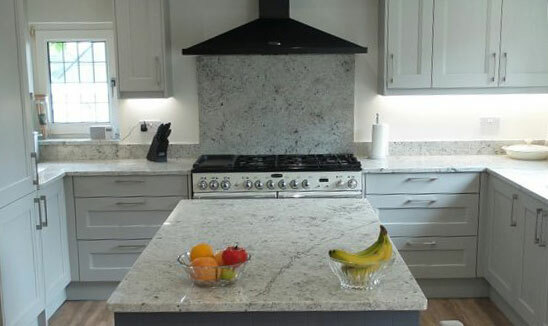 The granite work surfaces were provided by Mayflower Stone and flooring by Furnishing Collections, both recommended by Nathan and Derinda. 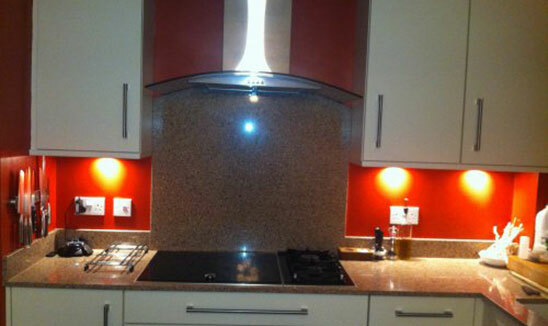 On completion there were a few minor issues which were resolved quickly and efficiently. 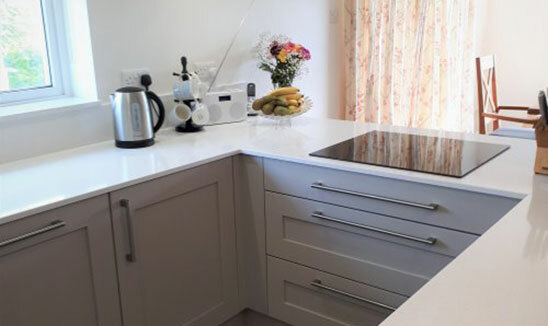 Thank you KF Kitchens for a project which was outstanding in all aspects, from early advice and planning through to after sales service – not forgetting Derinda’s cups of coffee from her magic coffee machine – one of which was a last-minute addition to our new kitchen. 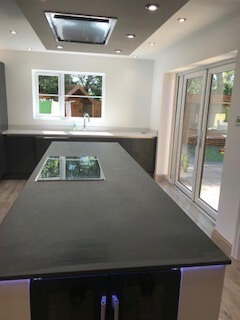 Just to say, a big thank you to the team at KF KITCHENS, we are happy customers and really pleased with the service we received and the end product, from Nathans ideas and patience through to Ernie's plastering and Gary's perfectionism and attention to detail, very professional company, highly recommend! 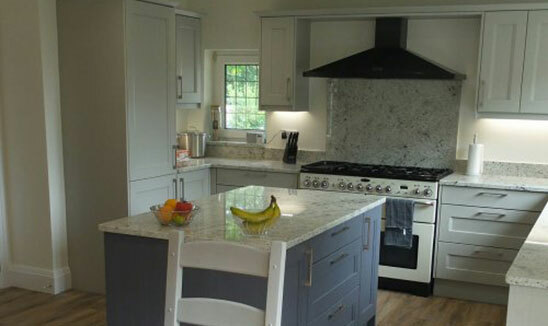 We had our kitchen done in February this year and are thrilled with the design and flow of the kitchen. Big thank you to Nathan and Gary the fitter. 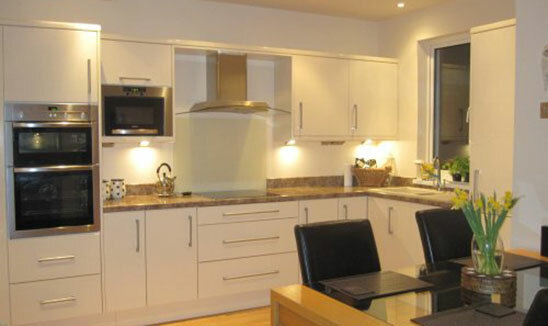 KF Kitchens provided good service and were sensitive to my budget - no hard sell. The fitter was excellent. I have recommended to my friends. Fantastic. Nothing more to say, except "THANKYOU". 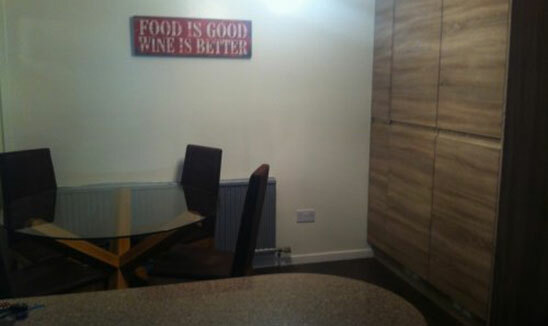 This review comes about 6 months after the kitchen refurbishment was completed. So you will get an idea of the pre and post-sales support. Pre-sales: Simon delivered on the overall design. Listened to how the kitchen is used within the context of our family's lifestyle and the need for adequate storage and a decent uninterrupted length of work space required. 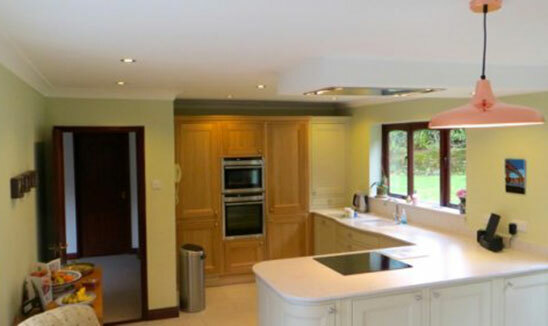 Refurbishment: The overall visual appearance of the finished product is excellent. 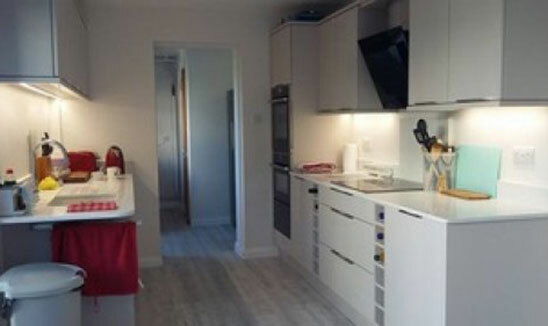 Constructive comment: when converting from a free-standing gas cooker, fridge and freezer to all electric double oven and hob and built in fridge then discuss with the designer and then clarify with the fitter where holes etc will be drilled into the back of your units to allow sockets etc to be brought through and to accommodate where plumbing work isn't going to fit hidden behind the unit. I was unprepared for this, for instance, forgetting that appliances come with the sockets already fitted. This means a 2-3-inch hole being drilled into the back of a unit to bring the lead through to plug into the socket which is also fitted inside the unit. Having this placed near the bottom of the base unit at the back has meant a 2-3-inch loss of depth to the unit in that area. Placement near the top for example would have prevented this. 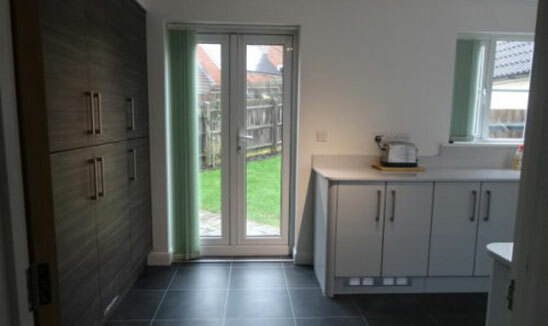 I would recommend you negotiate these points with the designer at the design stage to agree an aesthetic and more practical location for these and to have the 'boxing in' to hide the wall behind added into the job plan. 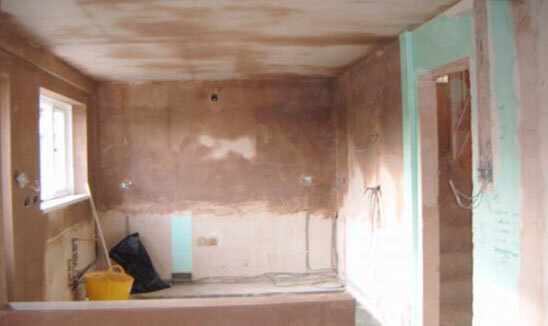 Plastering finish was very good. 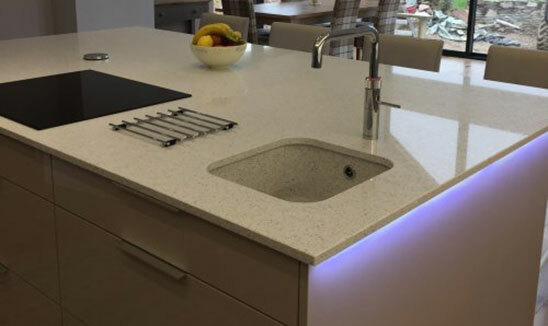 Aftersales: If you have a stone/quartz worktop, be prepared for a bit of settlement that may require a minor lift and redo of any sealed joints. The Saltash company Mayflower Stone have been very good and dealt with this requirement. The NEFF appliances are very efficient. 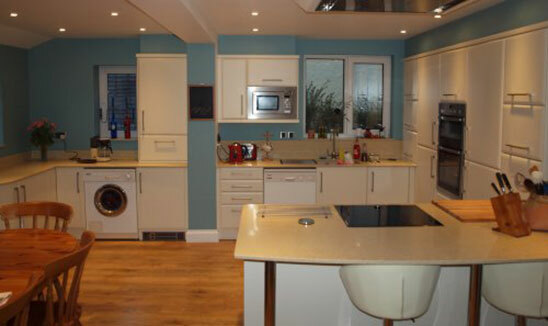 We had our kitchen fitted in May 2012, nearly six months ago. 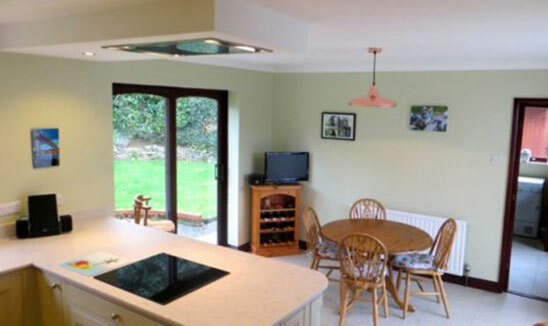 Having now used the kitchen to its full potential we thought it was time to put some photos and comments on the website. Prior to using Nathan we had also had some very good quotes from other local companies. We decided to use Nathan because on his initial visit he immediately had a vision of would he could do and suggested some new ideas. In addition he was able to give us an accurate estimate of the cost during this visit which no other company had done. 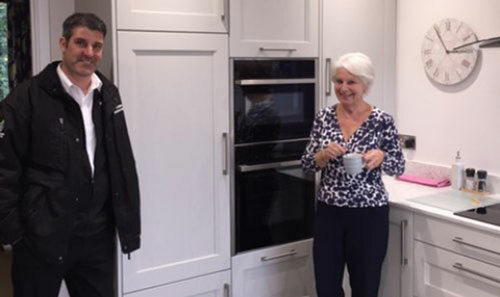 We spent a considerable amount of time in the showroom discussing the finer details and Nathan was always available to give advice and recommendations. 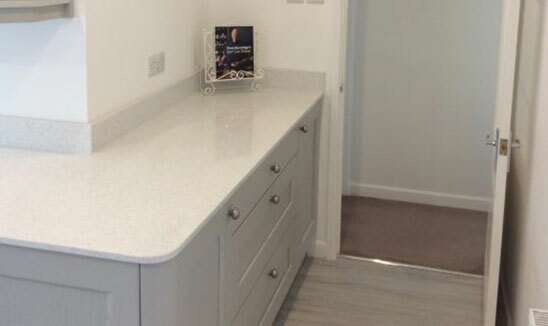 We were very impressed by the friendly and professional attitude and workmanship of the tradesmen plus the additional help and advice with the flooring from Richard Harding of Furnishing Collections. After completion of the kitchen we discovered scratches on two of the units. Nathan immediately ordered replacements with his normal efficiently. 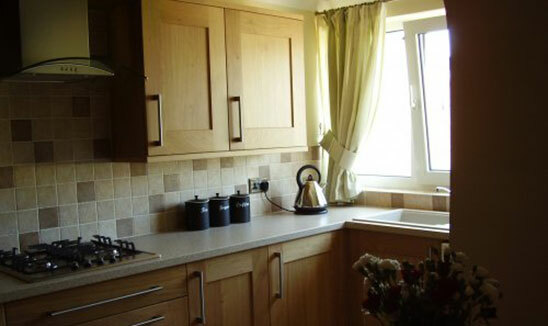 To sum up, having now used the kitchen we are absolutely delighted! We would have no hesitation in recommending Nathan and his team for a job well done. I would just like to say that my wife and I were extremely impressed by the level of service we received from ordering our bedroom, to the completion of fitting it. Peter and Paul were excellent, and nothing was too much trouble for them. The whole job was a smooth transition from start to finish. Nathan and Derinda were most helpful at the planning stage and the bedroom looks just like the computer-generated images that Derinda printed for us. We are over the moon with our new bedroom and it is now a privilege to sleep in there. 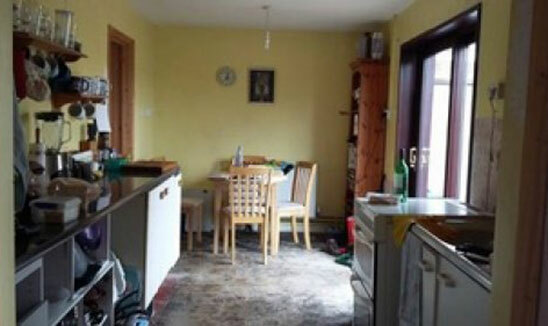 Bill and Mo's kitchen before and after. 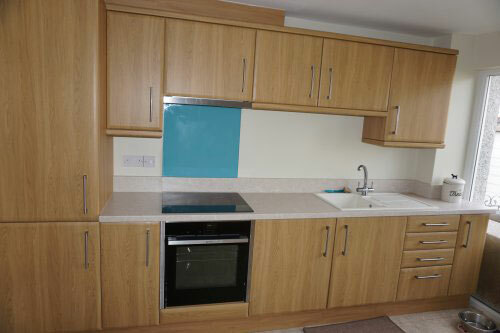 Attached are the images of our new kitchen. Everything was first class. 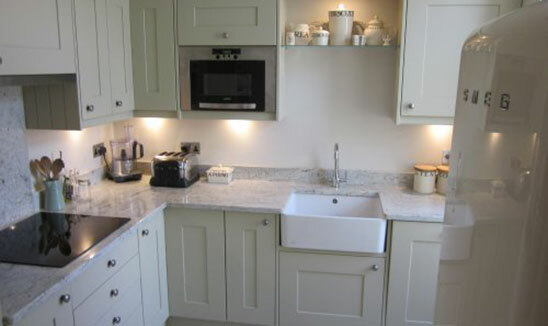 Would highly recommend KF Kitchens. Excellent work from Kevin, Ernie, Matt and everyone involved. Not forgetting Simon, Nathan and Dee. Recently had our kitchen renovated and would like thank Nathan for a superb design, and Gary for fitting, everything had to be just right. A pleasure to have you in our home. Our thanks also to James, Mark, Jamie and Jason for their input. 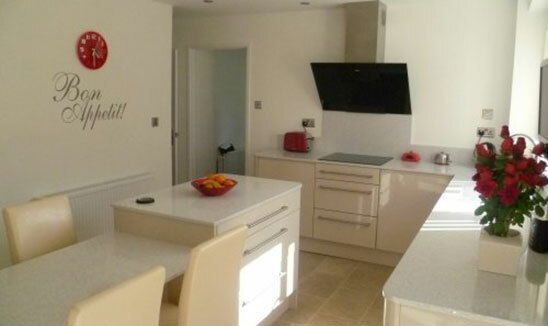 I had my kitchen designed made & fitted by Nathan and his team at KF kitchens at the start of 2012. I was in a bit of a rush to get the job, started & so they actually started on 3rd Jan while everyone else was on holiday. 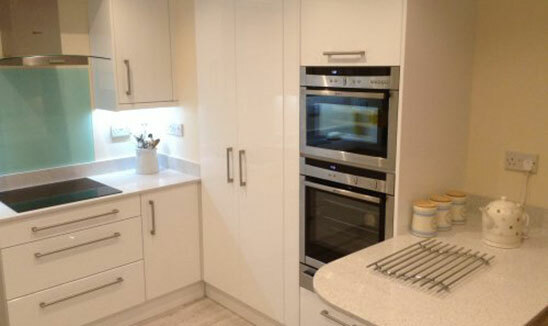 From start to finish the process was seamless, I can thoroughly recommend KF kitchens & will be using them again whenever I move to a new house. There was only one small problem discovered after the install which is incredible considering the amount of re-plumbing of gas & water pipes & re-wiring needed! Needless to say, this was fixed immediately & turned out to be fault in the manufacturing of the dishwasher drain pipe. After sales care and support has also been exceptional. 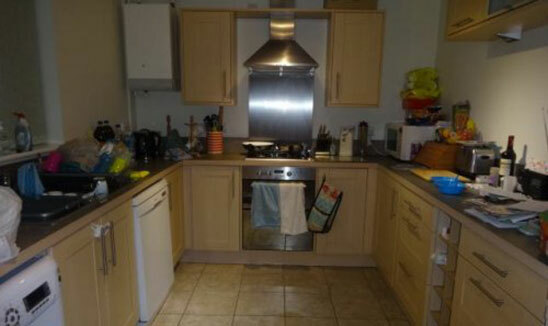 I will take some photos of the kitchen to send once I have cleaned all the dust up from having my bathroom done. Apologies for delay in contacting you since completion of our kitchen but would like to thank you for your excellent service. Despite some unforeseen problems, your guys managed to produce a superb finish, and nothing seemed to be too much trouble. Our stock of teabags is only just recovering!! 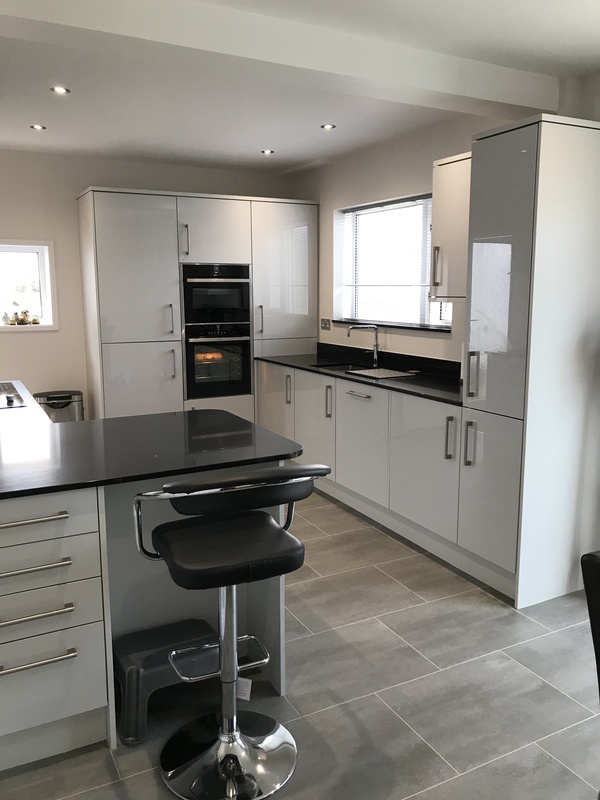 Nathan turned a dream into a vision, Gary turned that vision into reality; the result is an outstanding kitchen which meets our highest expectations with the visual impact to match. 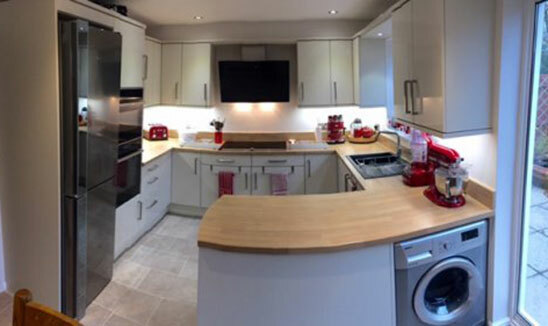 Simon - thank you so much for the time you spent helping us to design the kitchen and the advice you gave on appliances and the superb value for money. 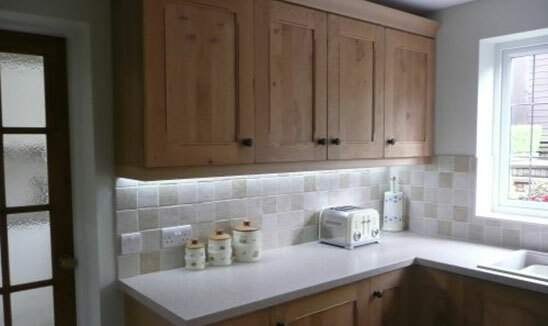 Peter - The level of service provided by Peter and his son whilst fitting the kitchen was superb and he completed the installation as planned. 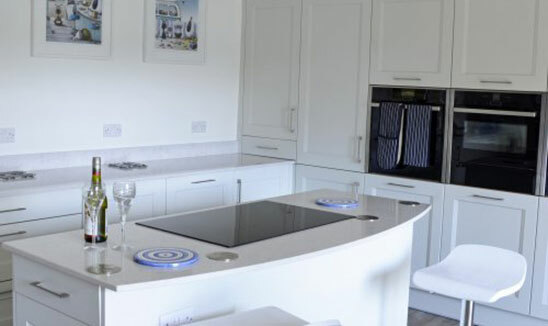 Their attention to detail was obvious and the aftercare we have received has been outstanding and I will certainly be recommending KF and Peter to my friends. Nathan sold us not only a kitchen but an idea. His vision of what would look good and be extremely practical was very sharp. 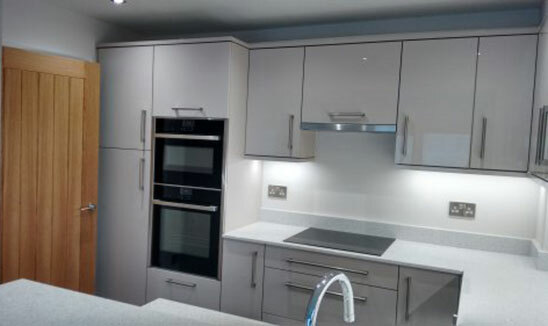 Attention to detail is also to be commended; even down to changing the metal extractor handle for a high gloss handle to match the rest of the units. His team are to be commended too! 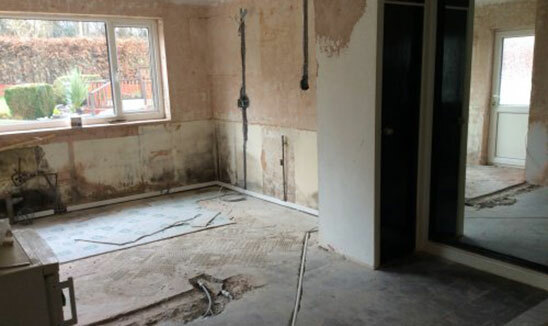 This company put together the use of a number of trades run by very skilled men, all of whom were polite and always ready to listen, and in my case went beyond the call of duty when they found a problem I had not been aware of for over 12 years! 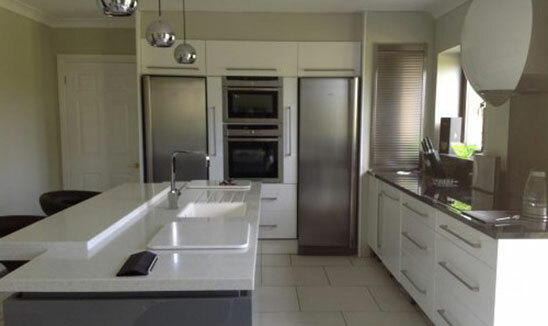 Thanks Matt, you did us proud :) KF kitchens were the only company we approached, after talking with Nathan we both felt there was no need to look elsewhere. 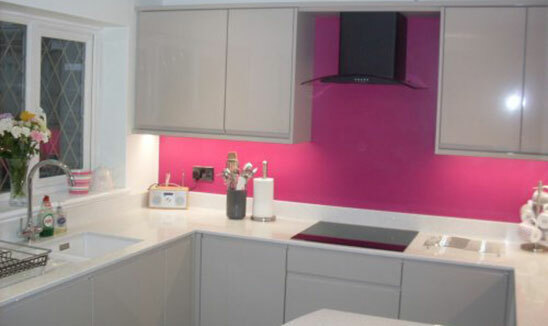 Any teething problems were sorted at the end, and again, nothing was too much trouble for KF kitchens to put right. 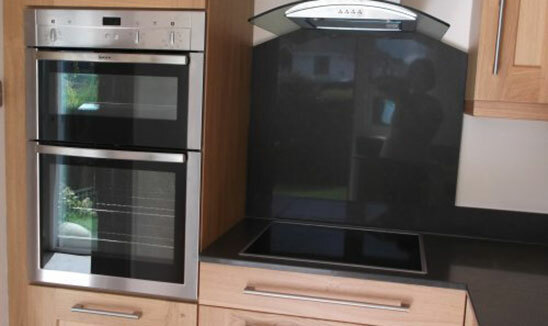 The aftersales care is equally as good as the quality of their kitchens! Thanks guys! Nathan- Many thanks for the design input which we never thought about. Peter and son for the fabulous installation. The level of support from start to finish excellent. 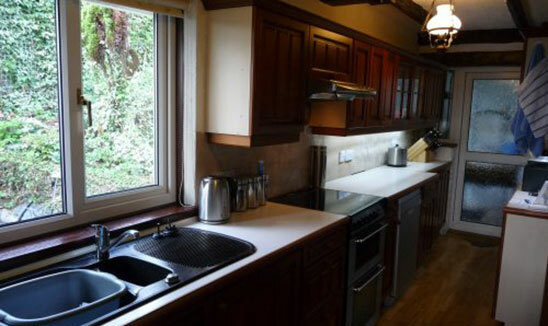 We now have a fabulous galley kitchen, with dining table in the middle which we are keen to show off. 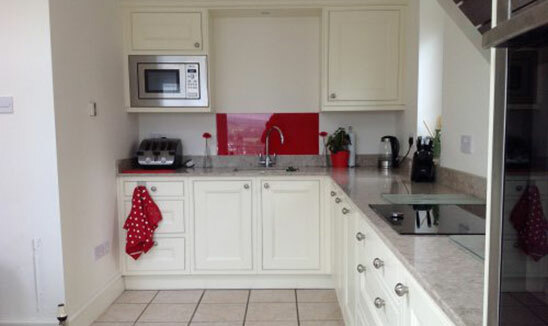 What a beautiful kitchen I have please look at my pictures. Nathan and his team were professional from start to finish. 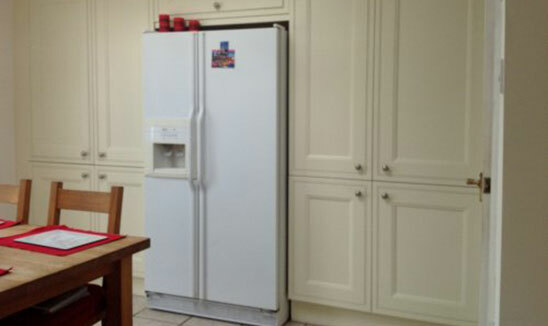 I had problems with an appliance, but Nathan sorted this for me which ended in me having a replacement. Nothing was too much trouble for him. 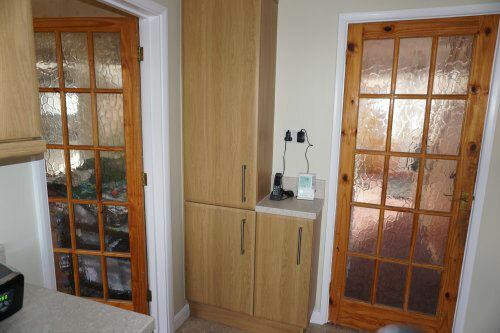 Fantastic quality units. Kevin the fitter was absolutely brilliant and made the whole experience an enjoyable one. 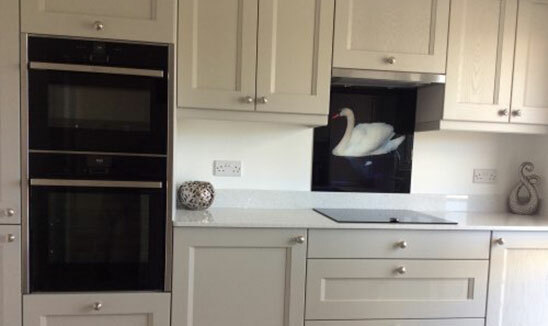 WELL DONE KF KITCHENS I LOVE IT. 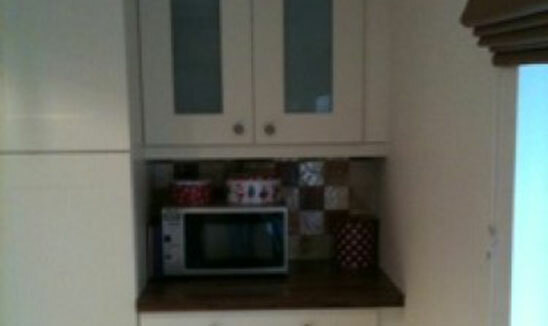 Just had my lovely new kitchen fitted and I'm absolutely delighted with it. 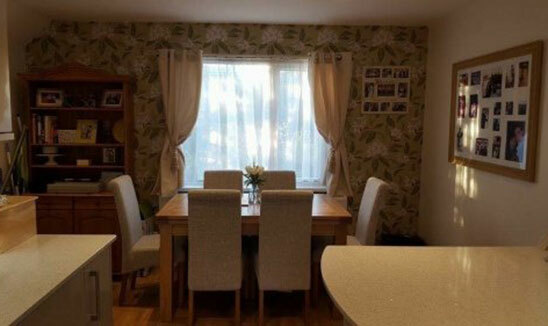 As soon as I met Nathan and Simon and realised how professional everyone involved is I was confident that I would get exactly the kitchen I wanted. 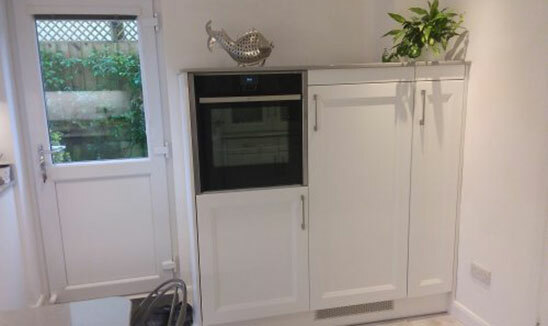 I have to say that the whole process, from planning and ordering to fitting and tiling, was seamless and nothing was too much trouble (including my late alterations to the units!) 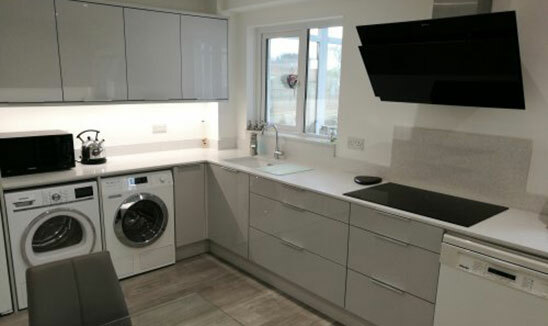 I was given excellent advice about what units would look well and the range of appliances available, but never ever urged to have anything I didn't want. Clearly Nathan and Simon want you to have the kitchen you want, and they have all the expertise to help you achieve that. 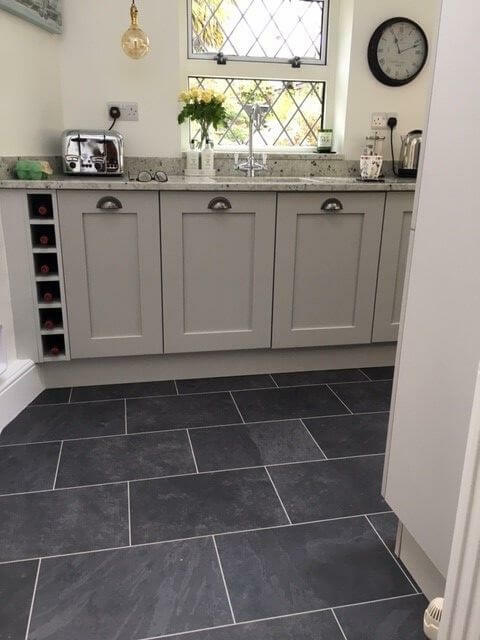 The kitchen was fitted by Kev, a true professional who works to an amazingly high standard with every joint, every door, every handle absolutely perfect. 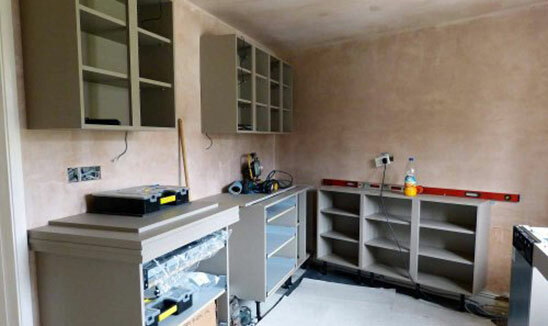 There was never any mess left lying around and it was exciting to see the kitchen taking shape each day! 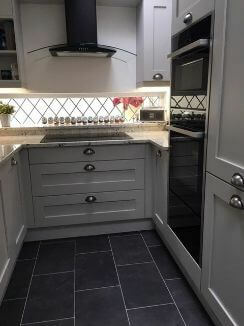 The tiling was also completed on time and to the same high standard and is just exactly what I wanted (thank you Keith!) 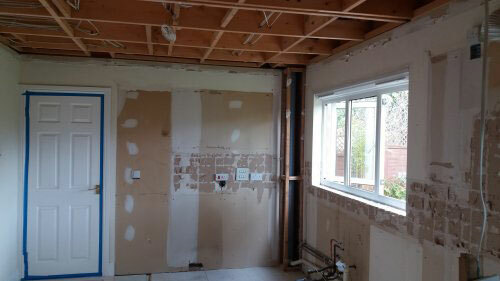 The work was started on time and the whole fitting was completed exactly within the timeframe given. 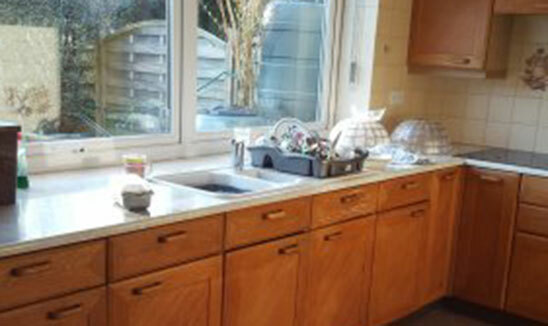 The cost of my kitchen came within the budget I had set aside, and I think I have excellent value for my money. 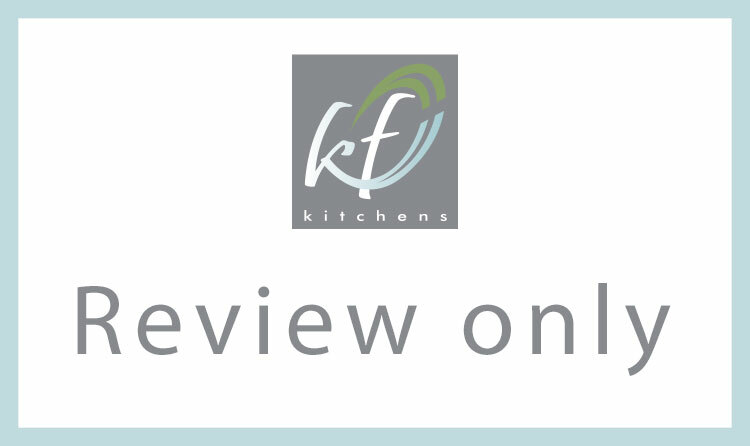 I have absolutely no hesitation in recommending KF Kitchens - in fact I can't rate them highly enough. I'd give 10 stars if I could! Take a look at the photos and you'll see what I mean about the standard. 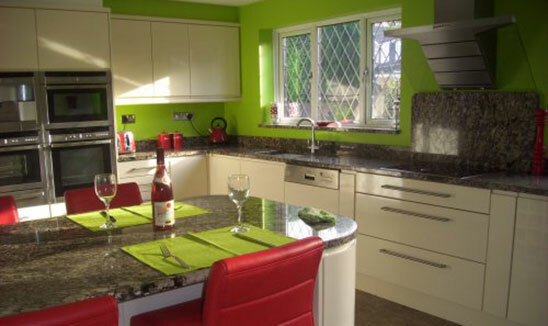 We are delighted with the whole look and quality of our new kitchen and already it has had many admirers. An update from us. 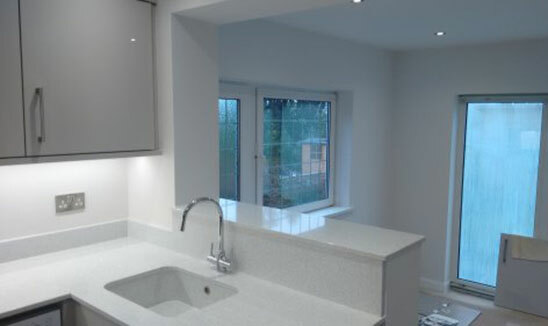 We had a problem with our new kitchen sink which was definitely not the fault/responsibility of KF Kitchens but nevertheless Simon and Nathan took it on board and approached the supplier on our behalf. 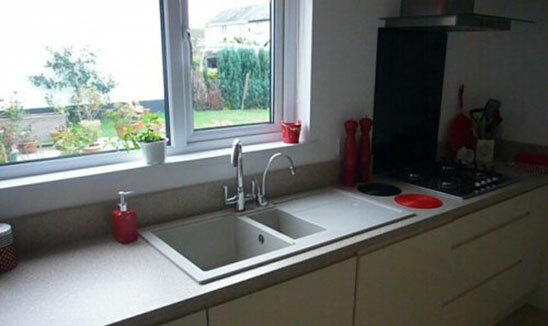 Not only did they secure us a new sink but went the extra mile and had it fitted at their own expense. 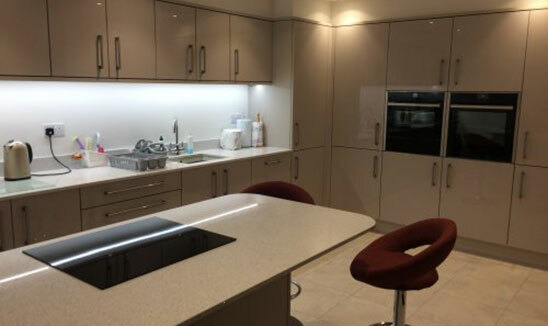 KF Kitchens have demonstrated that their after sales care is as prompt and professional as the original supply and fitting of our kitchen and in this instance they went above and beyond what might reasonably have been expected. How refreshing when there are so many companies who take your money and run!! 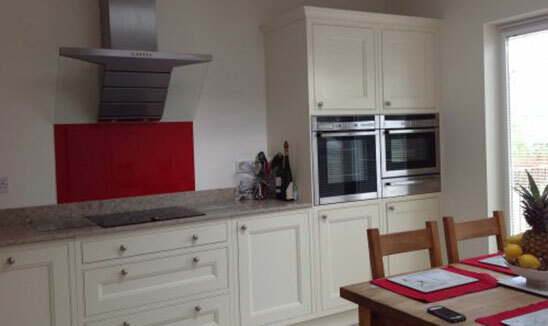 A big thank you to KF Kitchens for making our kitchen experience a fantastic one. From the first day we walked into the showroom, the planning by Nathan, choosing the kitchen and the fitting by Gary was second to none. Could you thank Pete for mending my door today. 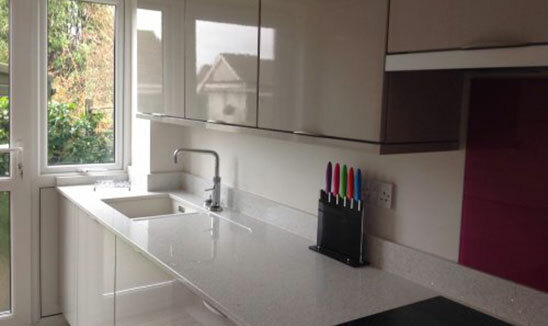 Great service from the designing of the space available to the finished kitchen. 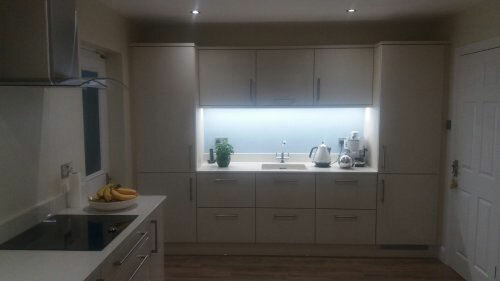 Would highly recommend KF kitchens. 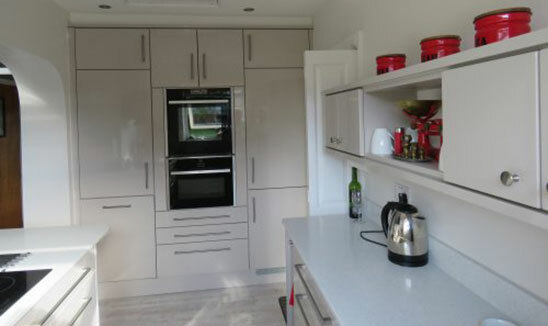 We used their kitchen fitter, did a great job, didn't just fit the kitchen but paid particular attention to the detail to make sure everything was perfect. 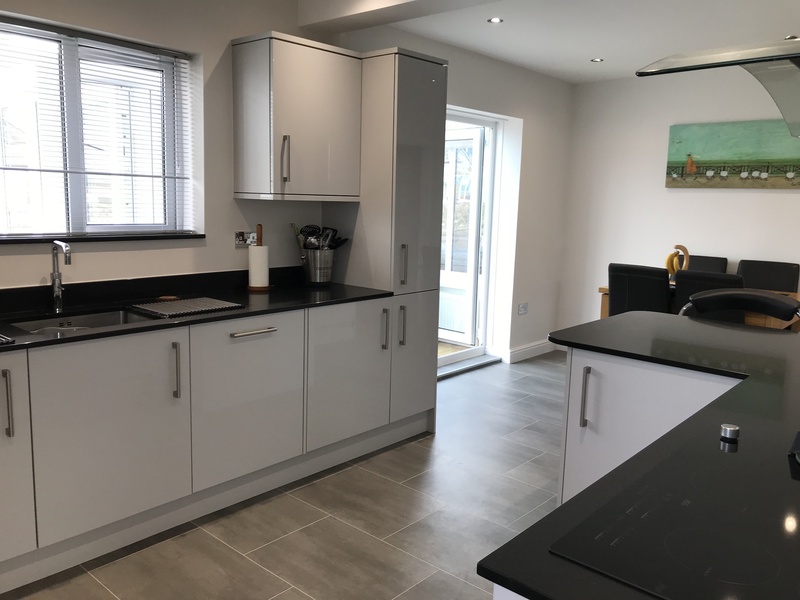 My kitchen looks fabulous, everything was expertly done and all the guys who came were great and I felt comfortable with them around. Peter and Paul are to be congratulated on the wonderful and efficient service given to my wife, Sue, and me this week. The work was of the highest quality all carried out with good humour, and style. They completed the work on time and were more than willing to amend minor matters as work went along. Thank you for a job well done from the moment we came back to you last Christmas. We will have to think of something else for you to do. You fitted the Kitchen too well to change it again! All best to wishes to you and your excellent company. 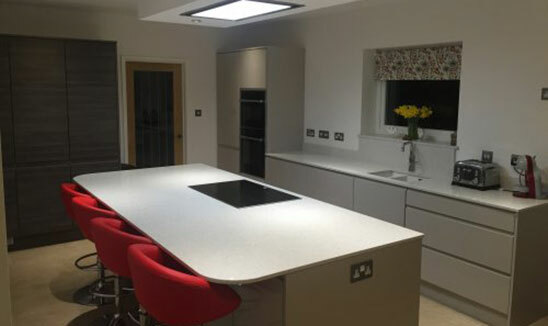 The project of replacing our kitchen was close to cancellation after numerous approaches to and assessments of other suppliers, then we were fortunate enough to try KF Kitchens. From the outset we were impressed, their showroom was superb but that of course is no guarantee, then we met Nathan and discussed our ideas, at long last we knew we had found the company in which we could have confidence, no pressure selling, an in-depth knowledge of products and design, sensible pricing, on site visits to confirm dimensions design and practicality. All very impressive and the best was yet to come, installation by Kevin, a perfectionist, fantastic! In short, to say that we are delighted with the outcome is an understatement. 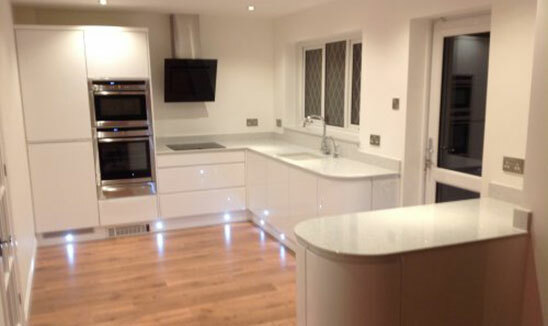 Very well done KF Kitchens, we are very grateful. 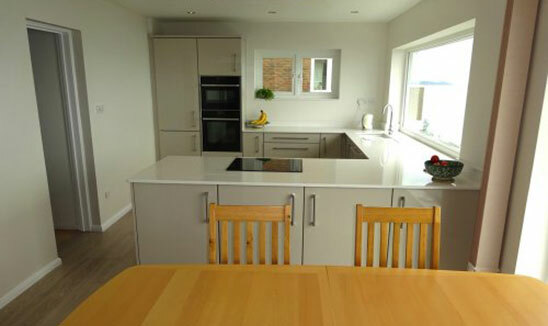 Extremely pleased with our Kitchen from the design right down to the fitting from Nathan & Kevin. Many thanks for a great all-round service, highly recommended. Kindest regards to the whole team. Cannot recommend highly enough!!! We trawled umpteen companies to come up with ideas that took in the brief that we had given all. Only Nathan came up with original, creatively modern and funky ideas. From the outset, it was clear that here was a person/company that were passionate about what they were doing. Throughout the whole process we were absolutely overwhelmed with the service we received. How Gary (main installer) kept calm and smiling is beyond us even when coming up against new contraptions e.g. insinkerator. Every member of the team was truly professional, and the end result just blew us away. 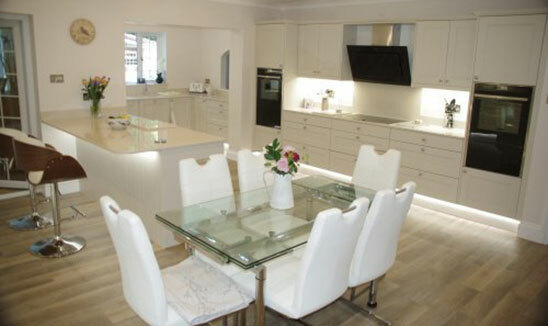 We highly recommend Nathan, Simon, Derinda, Gary, James and all the remainder of the team that make KF Kitchens the quality company that make your kitchen amazing!!! Thanks Team. 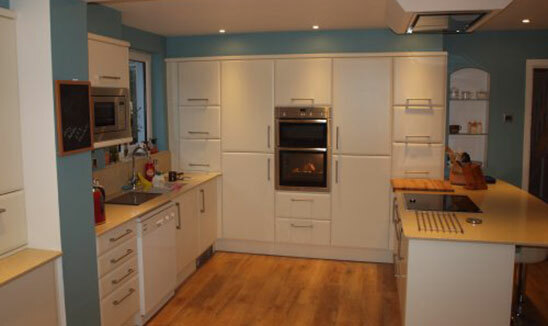 We were delighted with the service and attention which we received from KF Kitchens. From initial enquiry through planning and fitting and after sales care the service has been second to none. 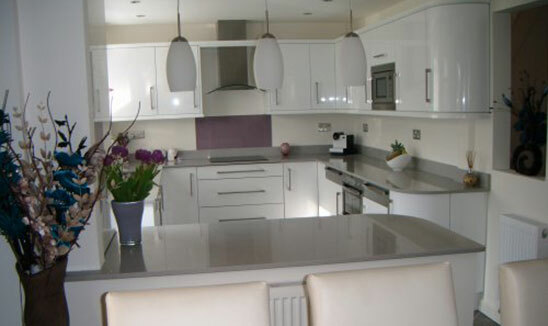 We would have no hesitation in recommending this firm to anyone considering a new kitchen. 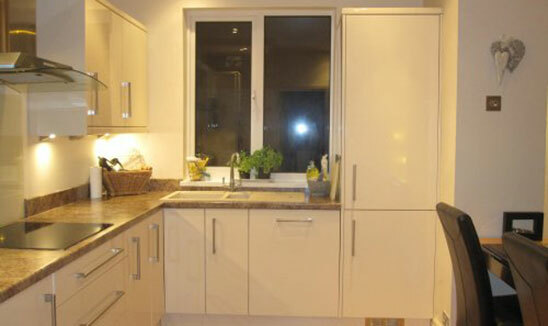 The help, guidance and support provided by KF Kitchens was excellent in all respects. 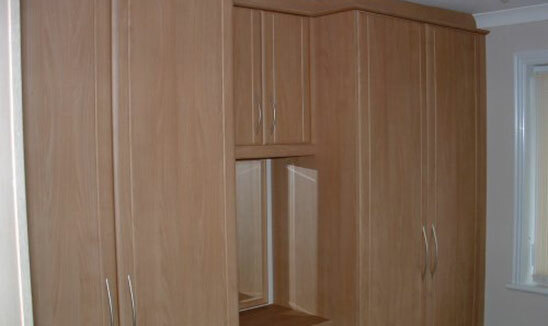 From the planning stage to choosing cabinets and accessories their professionalism was exemplary. 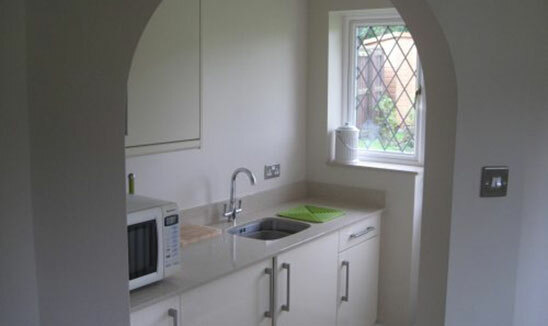 The kitchen fitter, plasterer, painter and electrician were all craftsmen of skill and integrity. 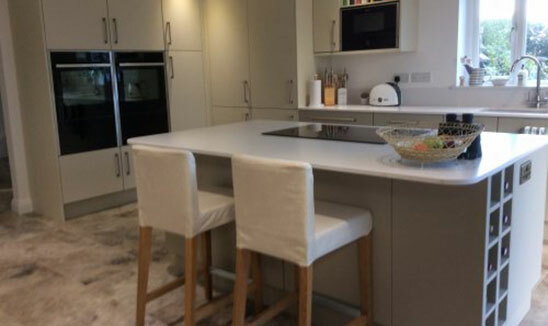 When a major error was made by the worktop company, KF kitchens were supportive and dealt with the problem professionally. 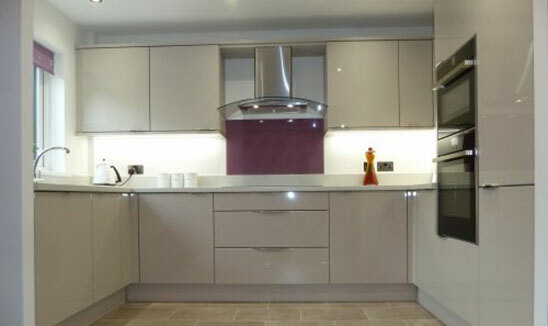 The final kitchen we had built was all we had hoped for both in terms of style and quality. I can recommend without reservation the service provided by Simon and Nathan. 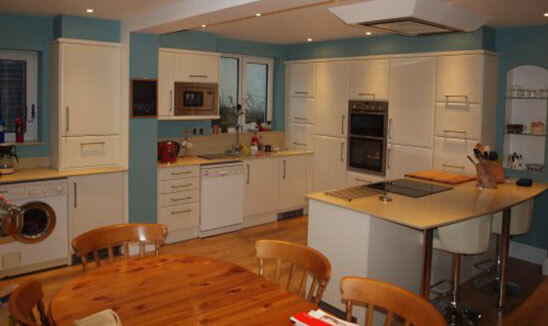 In January 2010, when we first started thinking about changing our kitchen, we had no idea what the whole kitchen buying experience entailed. It truly is a difficult process and unleashes a powerful mixture of emotions. 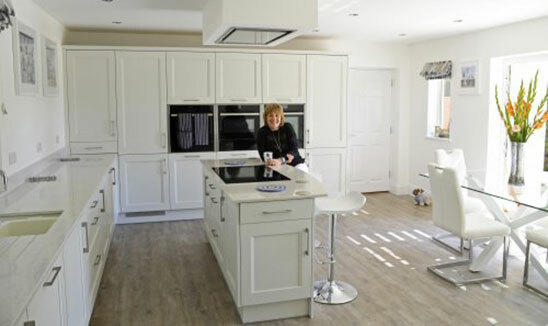 Make no mistake the decision to change is a big one and if like us, you have a perfectly good kitchen, which really just needs updating, there are a thousand reasons why you would put the decision off, particularly in these uncertain times. 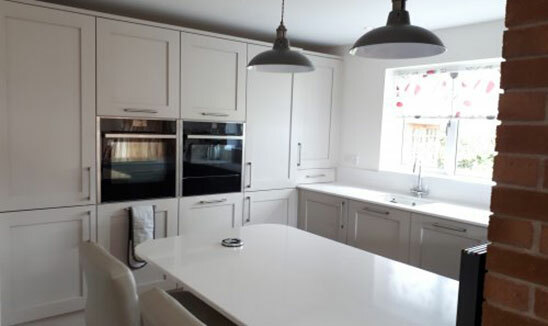 If like us you know that your kitchen is tired, in coming to your decision be assured of a KFF’s ability to provide you with something special. If you do this right the result is very rewarding. That is where KFF, and in particular Nathan and Simon really come into their own. Between them they have a number of years of experience and truly it shows. Nathan, or ‘Mr Symmetry’ as we christened him has that unique ability to settle you down and clearly steer you through the process. However for me his willingness to adapt to change and to almost mentally calculate dimensions and change the original plan is impressive. I also liked his use of a pencil and rubber, yes you do get the CAD’s but the ability to respond quickly on the spot with a ‘back of a fag packet’ illustration is invaluable. The backup CAD was never very far behind. Simon on the other side has an earthy gritty honesty that totally convinces you of their genuine desire to supply you with a truly exceptional end product. They know what you are embarking on and help you in all sorts of ways but in a very relaxed manner. Believe me we are difficult people to influence, and we had very clear views of what we wanted ultimately. Between Nathan and Simon we fairly quickly whittled that down to a choice of two totally different designs. At this stage I felt that KFF, ‘earned it spurs’ simply by leaving us alone. They are savvy and were fully aware that we were going to compare prices product service etc with other suppliers. They allowed us to do so without pressure. That was not true of others who wanted to force us into a quick decision. 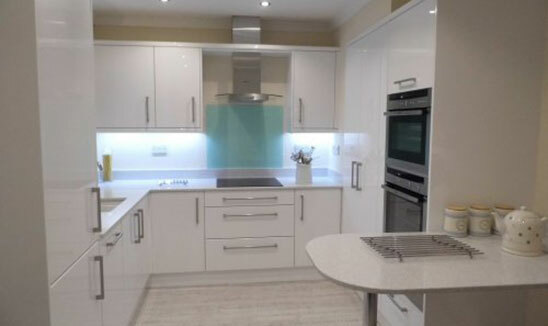 I’m 57 and the decision to spend £30k on a kitchen when my first house cost me £10k is not one that I take lightly. At this stage I might make mention of Nathans Sister, his wife Dorinda, Nathans mum and his delightful children. By their presence in the showroom they truly have the ability to settle you down, as you oscillate between near divorce, and euphoria (that you have finally come to a decision which has divided you as a couple for many weeks). The whole ‘family thing’ is actually quite disconcerting, but it is what it says on the box. These are genuine people trying to do a really good job for you in a very natural way, they are fun good-natured folk. 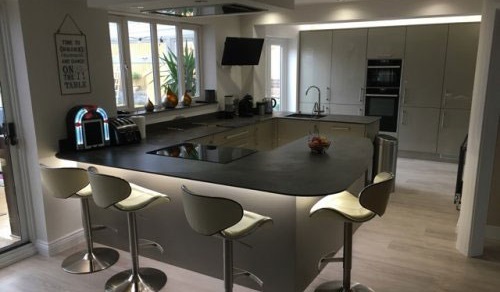 The showroom is the best in Plymouth simply because it is the biggest and even though you might not think you would be able to do a certain design, believe me Nathan is particularly good at building up your kitchen from a number of different ideas and kitchen displays. We suggested some lighting which Nathan didn’t have, but by the next visit he had sourced it and fitted it on a display. KF’s business model works, they sub contract the work, but they do not renege on their responsibility for the end result. If you have doubts about things and you will they can often present very practical solutions. 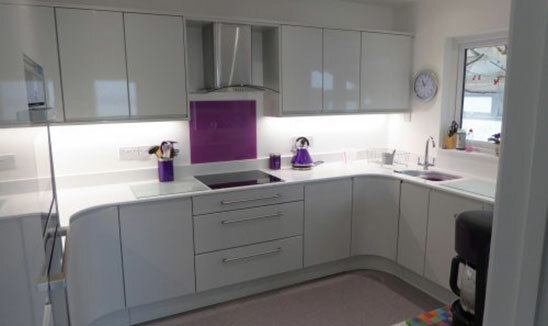 We wrestled with subtle or bold colours for our splash backs, they suggested just use paint until we progressed on to the more expensive coloured glass options –simple! The people they use are professional, hardworking very experienced and more than that very decent. Oh and fun, who wants dull people around the place!! You would have no concerns to invite into your home, give them to key and trust them with your life’s possessions. 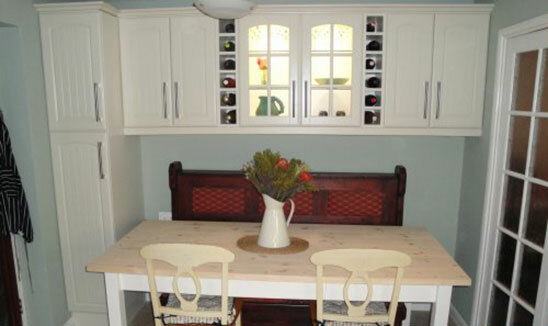 They make the minimum of disruption and the quality of the workmanship is excellent. I fancy myself as a bit of a ‘do it yourself’ expert, these guys show you why you’re not. Unexpected things happen, they have all the answers and they take it all in their stride. You don’t need to panic; they have it sorted before you know. Same is true for the inevitable snagging. 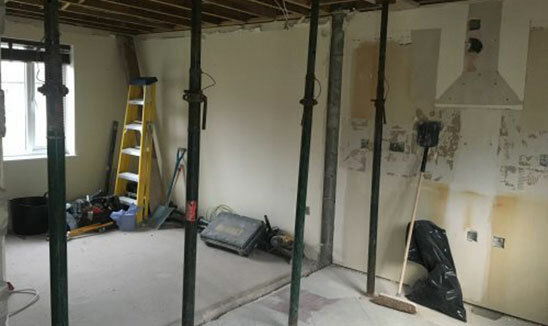 Any little issues that arise after the job is completed are tackled with the same professional friendly approach – and quickly. To sum up, if you are about to make this decision, prepare yourself for a bit of a helter-skelter of a ride. But if like us, you decide to go with Nathan and his team, and my experience is anything to go by, you will end up with a super end result. We love our kitchen it has perfectly clean lines and symmetry and as such is very unforgiving. If anything was wrong, it would stick out like a sore thumb. It’s turned out better than we imagined, both stylish and incredibly practical. Quality of the cooking not improved! From the first time we spoke to Simon and explained what it was that we would like to achieve, the service provided was excellent. 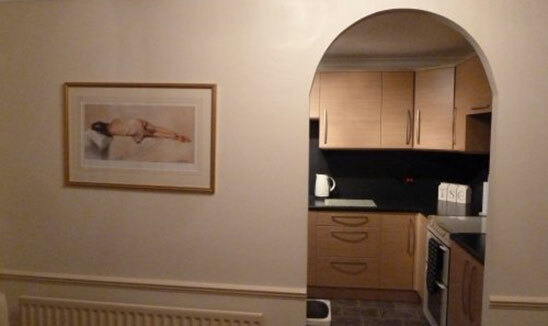 In comparison with other quotes we had been given the advice was invaluable and the price very comparable. 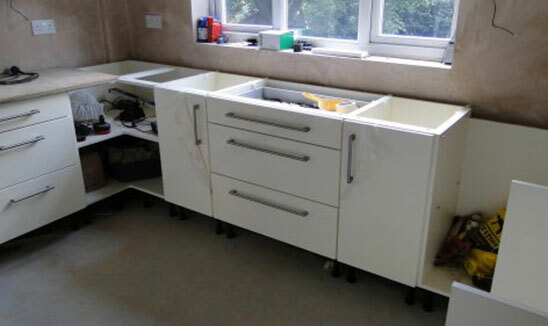 Nothing was too much trouble even the fact that due to extensive building work, the kitchen units were kept in storage much longer than expected. 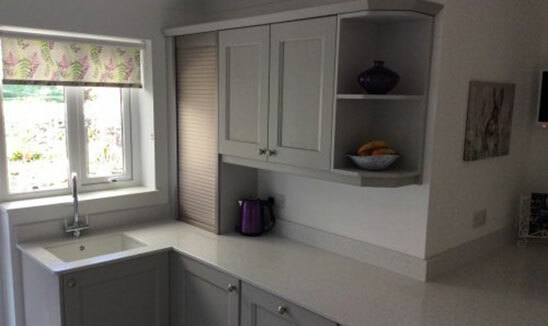 Fitting of the kitchen was carried out to the highest possible standards and again late alterations were never too much trouble and were overcome without fuss. 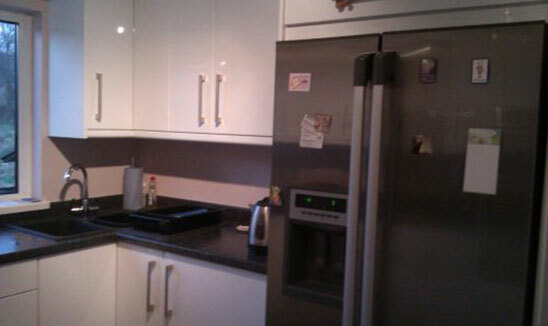 The kitchen fitter came back to conduct further alterations post finishing the original work without any problem. We would definitely recommend the company because they did a first-class job at a very reasonable price and without any complications. 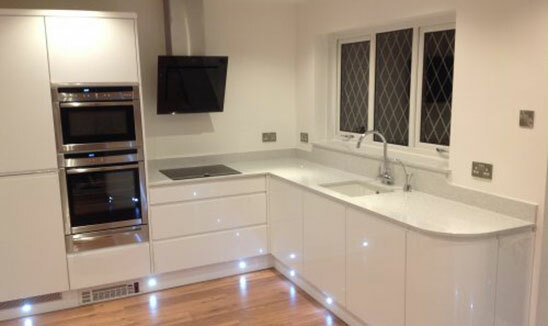 We are extremely pleased with our choice and the completed job. Well done to Nathan, Simon and Derinda. 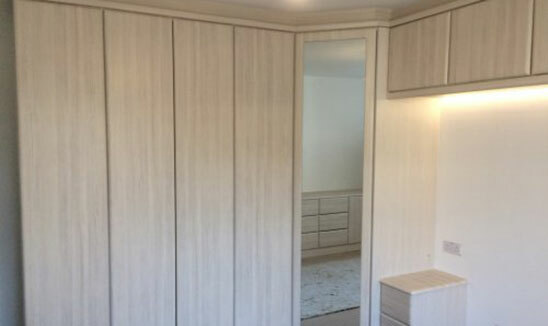 This review is for our recently fitted bedroom furniture. Beautiful quality, looks really good. Our only negative comment is the fact that we were left with some pencil marks alongside the fitted furniture. 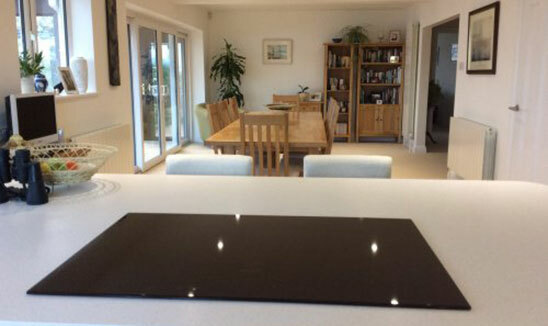 Having fitted numerous kitchens in Plymouth the product, design and organisation of the kitchen you supplied my father was by far the best I have encountered in eight years of kitchen fitting. Superb- what more can I say?